We present a fast auto-tuned library for computing non-uniform fast Fourier Transform (NUFFT) on GPU. The library includes forward and adjoint NUFFT using precomputation-free and fully-precomputed methods, as well as Toeplitz-based operation for computing forward and adjoint NUFFT in a single step. Computation of NUFFT depends heavily on gridding parameters, desired accuracy, trajectory type, amount of undersampling, and level of precomputation. The library automatically chooses optimal gridding parameters and algorithms, and it can be easily extended to include implementations from other libraries. The library allows researchers to accelerate iterative reconstructions without the difficulties of choosing optimal parameters and algorithms. ASL has drawn tremendous attention from both research and clinical community during recent years. Therefore, we deployed a cloud-based tool for ASL data analysis on top of MRICloud platform. Different from other downloadable ASL toolboxes, ASL-MRICloud features an automated interface via a web browser for data upload and results download. The computation is performed on the online server. 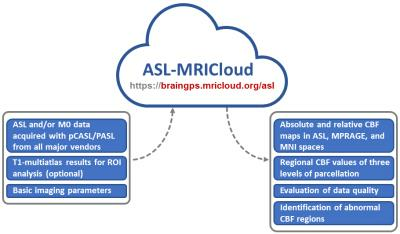 Here we summarized the current functionalities, underlying algorithms, and representative results of ASL-MRICloud. Assessing the quality of MRI is necessary and time-consuming. MRIQC automates the quantification extracting a number of image quality measures (IQMs), and eases the individual inspection through specialized visual reports. 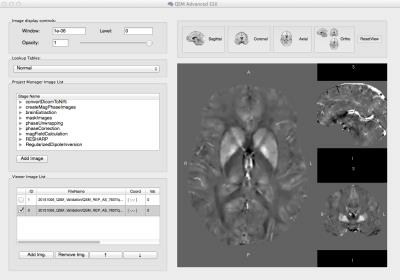 MRIQC supports T1w, fMRI and dMRI brain images. MRIQC is an easy to use, “plug-and-play” tool, since it is multi-platform (including desktop and high performance clusters), and BIDS- and BIDS-apps compliant. The IQMs extracted automatically will yield unbiased exclusion criteria in MRI analyses. 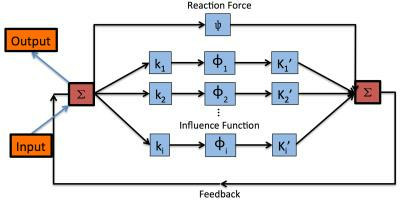 There exists no objective framework for assessment of acquisition and reconstruction methods in compressed sensing (CS) MRI involving temporal dynamics. We propose a simulation framework to address this gap. Image quality was assessed using two quantitative metrics, and temporal parameters were recovered using least-squares fitting. CS regularization weighting was varied to determine the effect on both image quality and accuracy of recovered temporal dynamic parameters. Image quality metrics displayed distinct optima, though bias, dependent on the underlying temporal dynamics, was introduced to temporal parameter estimates. These results support the need for an objective tool to characterize CS MRI methodologies. There is a need for an MRI diagnostic analysis-tool which can provide healthcare investigators with a platform for extraction of relevant information and allow for comparison with similar cases to aid decision-making. 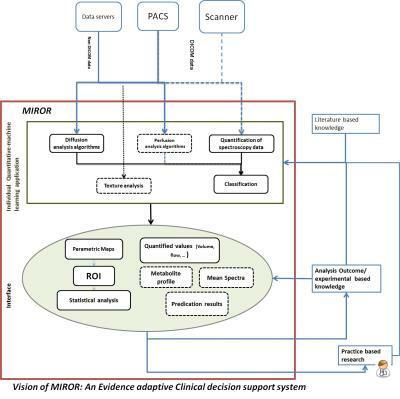 The aim of this study was to develop a modular, non-region-specific Medical-Image-Region-of-interest-analysis-tool and Repository (MIROR) in order for advanced MRI techniques to become a part of the clinical routine. Here, the first development phase is presented as applied to diffusion-weighted-imaging of pediatric body-tumors combined with comparison to a repository of cases. MIROR acts as a foundation which can be extended to more advanced image-analysis and sophisticated decision-support. Evidence exists to show that phase unwrapping performed before channel combination results in fewer artifacts (singularities, open ended fringe lines) than when phase unwrapping occurs after channel combination. We have implemented a fast and efficient pipeline designed to enable processing of multi-channel phase data. Specifically, non-iterative phase unwrapping and channel combination are employed within the pipeline that links the MR scanner to a DICOM server, which displays the final combined images, while preserving all metadata. A C-library that simplifies EPIC pulse programming on GE MR systems is presented, containing a large set of new structs and functions for EPIC. Three pulse sequences have been developed (GRE, FSE and EPI) using this library with EPIC. These sequences have most of the functionality expected in a clinical neuro MRI setting, including arbitrary scan planes, full user interface support, online/offline reconstruction, and with common generic sequence plugins/modules such as SpatialSat, FatSat, and Inversion. 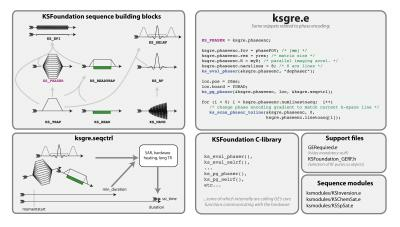 The KSFoundation library, pulse sequences and sequence modules can be used to quickly develop new pulse sequences with reduced amount of code. A major challenge for researchers in designing new pulse sequences is the limitation of needing to know vendor-specific programming environment. The Pulseq tool in Matlab has overcome this issue. This work demonstrates an open source implementation of Pulseq in GPI Lab to further access to Pulseq. Also, this enables a single platform on GPI to integrate the PSD with the rest of the MR research pipeline: simulation, reconstruction, image analysis and visualization. The Pulseq-GPI implementation is demonstrated through a gradient recalled echo. It is capable of designing all sequences/enhancements that Pulseq currently offers. In various image processing applications, finding appropriate mathematical descriptions which reflect or extract characteristics of the underlying content from acquired MR images is an important and crucial step. There exists a variety of features which can be used for MRI, but which ones are the most meaningful depends on the underlying scientific or diagnostic question/application as well as the image itself. To reduce the time spent searching for, implementing and testing features for a specific application, we provide a toolbox of features along with a GUI to easily choose and extract them, which will be made publicly available. Among the many packages available for data analysis in magnetic resonance imaging, only few offer specific tools for quantitative MRI. Additional limitations often come from implementation details, where fast development cycles and code maintainability can be difficult to achieve. Recently, Python has emerged as an ideal tool for the development of software for scientific computing.Here, we propose two easily extensible software packages implemented in Python: PyMRT for the analysis of MRI data, notably for quantitative applications; DCMPI for simplifying and automatize portions of the data collection step. A graphical user interface was designed in Matlab to process dynamic CEST-MRI experiments. Field corrections due to B0 and B1 inhomogeneities are applied, ROIs are taken, CEST signal is fitted, and high quality figures are produced with minimal user input. Data is presented for an exercise-induced skeletal muscle creatine elevation experiment though the GUI is highly customizable. It is challenging to teach and learn the very basics of Magnetic Resonance as used in NMR and MRI. A simple approach is demonstrated that provides accurate understanding of basic MR phenomena, also for non-technical students. 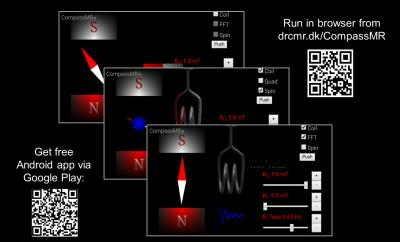 An interactive free simulation tool is used that invites student exploration of Compass and Nuclear MR via browser or app. This CompassMR simulator offers you a unique opportunity to finally make anybody intuitively understand MR in minutes, even your parents who always wanted to know what you are doing. This educational abstract is aimed at providing a better understanding of NMR principles and optimisation of scan parameters for imaging using graphical illustrations and images generated with the Terranova-MRI EFNMR system. It is benefitial to clinicians who seek a more intuitive way to educate themselves with regards to MRI; to students who need hands on experience to gain a better understanding of the underlying mechanisms of signal and image formation; and to academic researchers who are looking to introduce alternative teaching methods of MRI techniques in their institutions. 3D and 2D image reconstruction and other image post-processing techniques are vital in developing a complete understanding of anatomy and pathology. The ability to visualize structures in 3 dimensions, perhaps showing pathology in the orientation a surgeon will see as they approach during surgery, provide information which allows planning a procedure before the patient is under anesthesia can improve care and reduce surgical or interventional times. Further, 3D images or printed 3D models a valuable resource for teaching a patient or a child’s parent about the necessary care and treatment of their child. 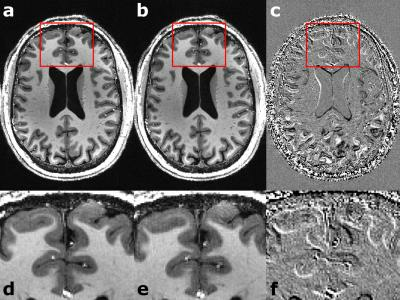 Accurate and automatic brainstem nuclei segmentation from MR images plays an important role in seeking for imaging-biomarkers of Parkinson’s disease (PD). To address the segmentation challenge from regular MR images, we propose a novel multi-atlas patch based label fusion method where we use hyper-graph technique to handle the low image contrast issue. Our proposed method is successfully applied to a set of MR images from PPMI (Parkinson’s Progression Markers Initiative) dataset, and we have achieved significant improvements in terms of segmentation accuracy compared to the state-of-the-art methods. 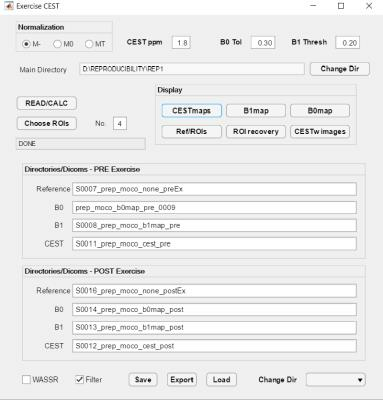 Cerebra-QSM is a modular C++ application for quantitative susceptibility mapping that logs the inputs and results from each stage of the QSM processing pipeline. It provides a user interface for analysis, review and process validation, as well as a scripting interface for batch processing. It is flexible and intuitive, allowing rapid evaluation of algorithms and training of end-users on the specifics of QSM estimates. It has been adopted by multiple researchers, facilitating independent work. Cerebra-QSM provides a robust, simple and scalable framework for evaluation of processing pipelines. Super-selective Arterial Spin Labeling (ASL) is a technique to perform non-contrast enhanced flow territory mapping. Prior to image acquisition, the labeling focus has to be positioned on each artery of interest separately. Depending on the arterial architecture, this process can be time-consuming, especially for untrained operators. In this study, an algorithm for automated vessel detection and planning is introduced to accelerate the planning procedure of super-selective ASL measurements, which is based on the Hough transform to detect circular structures (i.e. arteries) on a transversal time-of-flight (TOF) scan. 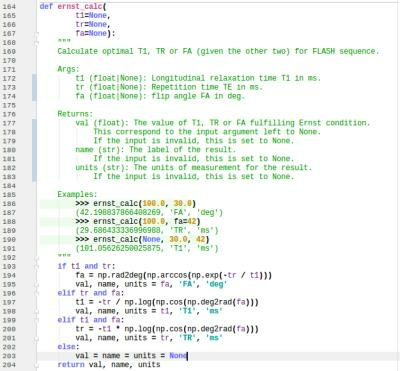 A previously demonstrated, platform-independent rapid prototyping environment for MR sequences that provides a workflow without code compilation has been extended with features that allow the creation of a FAIR Arterial Spin Labeling (ASL) sequence. Also, the calculation code for the necessary FOCI inversion pulse, which is protocol dependent and which needs to be executed during runtime on the scanner, can be implemented compilation-free using a scripting language. Despite high-performance, multi-GPU MR simulations are not widespread. In this study, we present coreMRI, an advanced simulation platform delivered as a web-service through an on-demand, scalable cloud-based and GPU-based infrastructure. coreMRI achieved with a 8xGPUs configuration a speedup of up to 63 when compared to a single-GPU configuration, bringing hour-long simulations down to a couple of minutes. In conclusion, coreMRI allows its users to exploit the highly-tuned computer performance of GPUs on MR simulations with neither upfront investment for purchasing advanced systems nor technical programming expertise. 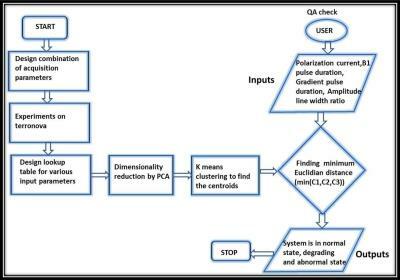 For the Rhineland study, a fully automated phantom QA procedure was developed to monitor the quality characteristics of the MRI scanners. Various QA metrics are investigated to characterize scanner stability and performance over time and across different sites. To ensure measurement reproducibility and consistency standardized phantoms were developed and a dedicated QA protocol as well as a processing pipeline was implemented. The QA scans are acquired each day after the last subject to be able to detect data inconsistencies and hardware defects as soon as possible. This ensures high-throughput data collection with minimal data loss. 3D radial, such as ultra-short TE (UTE) MRI, is receiving a growing attention, because of its unique features, which include free of motion artifact and imaging of short T2* species. However, reconstruction of UTE data is very challenging, therefore, only a handful research institutes possess the reconstruction capability. 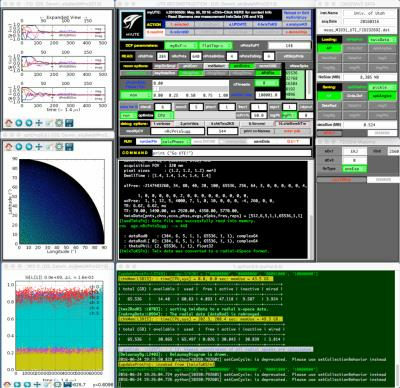 We developed a GUI-based software to construct UTE images using Python and C++ languages. We will present details about the development of this software using Python, which includes difficulties. Defining regions of brown adipose tissue (BAT) on MRI remains challenging. Dissemination of existing methods is complicated by propriety algorithms, variability between institutions, and the need for time consuming manual segmentation. In this pilot imaging study, we implemented an online segmentation tool for the open-source OsiriX DICOM viewer platform (Pixmeo, Geneva) that can be used to identify regions of BAT on MRI through simultaneous fat fraction and T2* thresholding automatic segmentation. Since an OsiriX plugin is easily distributable and usable across different centers, our tool may facilitate future research studies of BAT using MRI. A 3D TSE simulation tool designed as both an educational tool as well as a guide for optimizing protocols is described. The pulse sequence protocol user interface triggers integrated Bloch simulations for a user-defined set of tissues based on current protocol settings including the variable flip angle scheme and reordering mode. The tool models tissue T1 & T2 as well as flow effects. We demonstrate applicability to the issue of flow-induced signal loss in CSF and compare simulations to in vivo measurements. The effects of parameter changes that would otherwise require lengthy in vivo comparisons can now be easily explored. 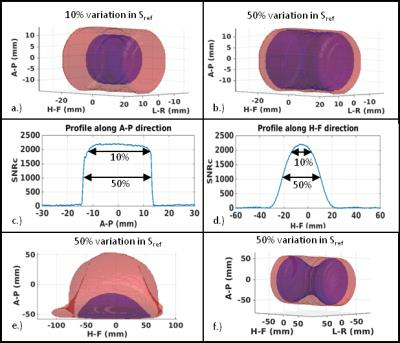 To choose the most suitable RF coil available for an MRI study, we propose a procedure which uses a calibrated phantom, a 3D gradient-echo sequence, and an automatic post-processing tool available on the web. This tool generates a report which contains the measurement of a SNR with uniform volumes located in the depth. 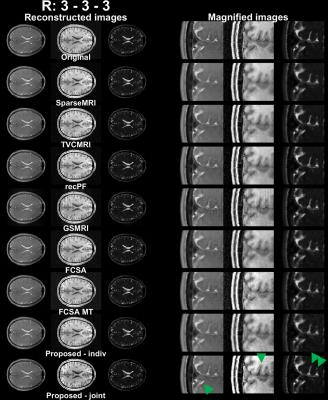 The post-processing could be done on MR images acquired on most main MRI vendors (Siemens, GE, Philips and Bruker) with prior verification of applied scaling or filtering. RF coil characterization results performed on at 4.7T and 7T were compared. The tool can be used for quality control. A multiband, multi-echo simultaneous ASL/BOLD sequence was developed and used to estimate cerebrovascular reactivity (CVR) using a breath hold (BH) task. 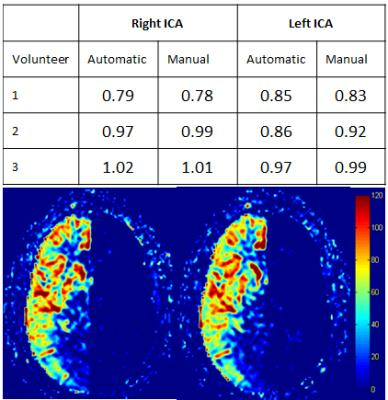 In addition, both the BOLD and ASL data were denoised using multi-echo independent component analysis (ME-ICA). ICA was used to extract the BH activation component from the data, which was then correlated with the whole brain. CVR was estimated as the percent signal change from the BH task. Denoising resulted in increased BH activation and more robust CVR maps. Furthermore, the data-driven approach used here eliminates the need to model for the complicated BH response. 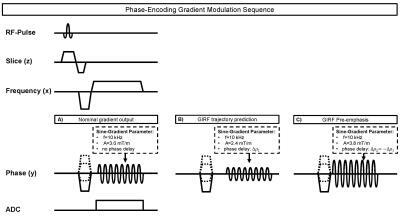 Many previously reported SMS-bSSFP sequences use RF phase modulation for slice shifting, which inevitably shifts the bSSFP frequency band and is thus susceptible to banding artifacts. Another slice-shifting method is to modulate slice-select dephasing/rephasing gradients. 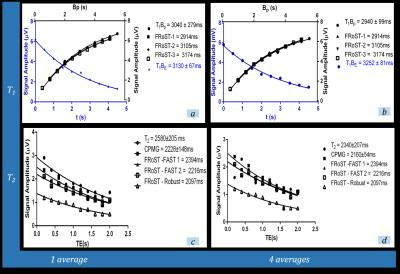 We have studied these two strategies and showed that gradient modulation is more advantageous, since it does not modify the RF phase cycling scheme and bSSFP frequency selectivity is kept the same for all slices. We have acquired phantom and in-vivo head images using both approaches, and demonstrated that gradient modulation does not introduce banding artifacts and produces high quality images. Simultaneous multislice imaging techniques are widely used to accelerate the acquisition process, however, non-ideal coil geometries can introduce noise enhancement. This effect can be reduced by using the virtual-conjugate-coil technique, in which case the g-factors will be dependent of the object background phase. It has been shown that an optimal phasemap exists that minimizes the g-factors. We have used 3D tailored RF pulses to approximate the optimal phase distribution in each simultaneously acquired slice to reduce the noise amplification in phantom and also in vivo. Our results imply that g-factors can be reduced significantly while flip angle homogeneity remains reasonable. A 2D multi-echo simultaneous multi-slice (SMS) gradient-echo imaging sequence was implemented for simultaneous anatomical imaging, R2* mapping and quantitative susceptibility mapping (QSM). Imaging acceleration in the slice direction speeds up the sequence to clinical scan times while using a longer TR and larger flip angle compared to 3D imaging. 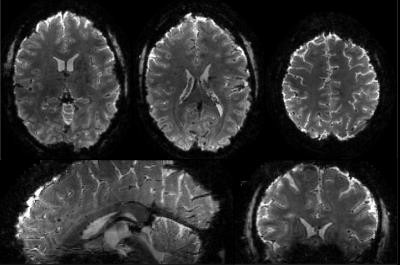 Evaluation from both healthy and multiple sclerosis subjects showed that, using the same acquisition time and imaging resolution as a 3D sequence, the proposed sequence improved tissue susceptibility contrast, suggesting 2D SMS GRE imaging may be a viable alternative for clinical applications of susceptibility-based imaging. 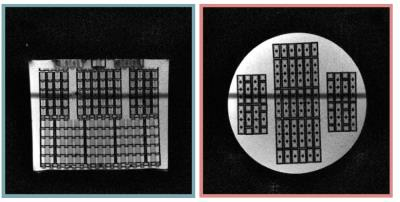 We describe a procedure for obtaining minimum duration parallel transmit pulses for simultaneous multislice imaging. The strategy involves a combination of the IMPULSE parallel transmit pulse design algorithm for mitigating local SAR hotspots and enforcing flip angle homogeneity; an optimal control algorithm for intelligent design of slice selective subpulse shape with minimum power; and time-optimal VERSE for reducing peak power with minimum increase in pulse duration. Results indicate a reduction in pulse duration by a factor of 4.9 compared to a pTx-SMS pulse designed with conventional techniques. 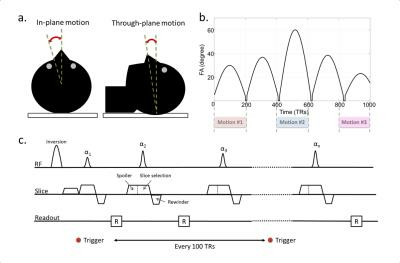 In this study, we describe a method to correct for motion in fMRI acquisitions with sub-TR temporal resolution, applying the Extended Kalman Filter framework, using each multi-slice EPI shot as its own navigator. Relaxation times can be measured efficiently with Magnetic Resonance Fingerprinting (MRF) but further acceleration of MRF is difficult as individual images are already highly undersampled. 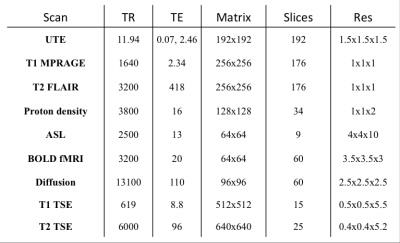 In this study Hadamard RF-encoding is utilized to acquire four slices simultaneously. It is demonstrated that the proposed method can provide T1 and T2 maps for simultaneously acquired slices at 2mm slice thickness. Triple-echo steady-state (TESS) has so far been investigated mainly as a particular robust and intrinsically B1-insensitive method for T2 relaxation time mapping. Here, its potential for fast simultaneous multi-parametric (T1, T2, PD, and B0) mapping of human brain tissues from a single scan is explored. 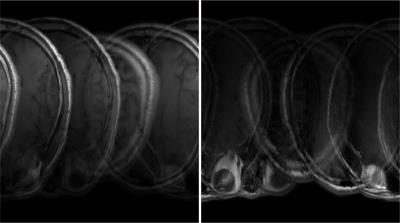 TESS imaging is performed in 2D mode to mitigate motion sensitivity in the brain and accelerated by simultaneous multi-slice (SMS) imaging using CAIPIRINHA to excite two slices simultaneously providing similar SNR in half the acquisition time as compared to sequential single-slice imaging. Spiral imaging substantially shortens MR fingerprinting acquisitions to tolerable scan times. Also more traditional “state-of-the-art” parametric mapping techniques can potentially benefit from the speed-up ability of fast spiral trajectories as opposed to Cartesian sampling. Here, a variable flip angle T1 quantification approach based on an interleaved 2D spiral multi-slice spoiled gradient echo sequence is combined with a steady-state preparation scheme. The investigated method offers accurate whole-brain T1 determination at clinically relevant resolution in only half a minute (including the B1 mapping scan in about 40 s) with an acceleration factor of an order of magnitude compared to conventional Cartesian sampling. We present a multi-slice approach to evaluate arterial cerebral blood volume with non-invasive inflow-vascular space occupancy (iVASO) approach using a 3D GRASE readout in conjunction with the iVASO preparation pulses. The benefits of compressed-sensing (CS) assisted turbo-spin-echo (TSE), i.e. CS-TSE, acquisition for variable-repetition-delay T1 measurement were investigated with two-dimensional multi-slice ex vivo and in vivo T1 mappings at 7T preclinical scanner. The direct advantages resulting from replacing the refocusing pulses of TSE with CS acceleration included reduced scan times for multi-slice coverage and minimization of inter-slice interferences, which are all required in order to improve the accuracy of multi-slice T1 measurement. 2D in-plane multiband RF pulses have been developed to offer high-resolution diffusion-weighted imaging (DWI) with minimal distortion. However, B0 and B1 inhomogeneities may lead to significant and varying signal loss in different bands, that can in turn result in signal inconsistency between bands. 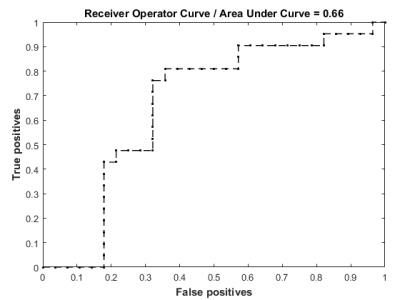 In this work, correction for B0 and B1 variations was implemented by independently tuning the RF center frequency and amplitude for each band. 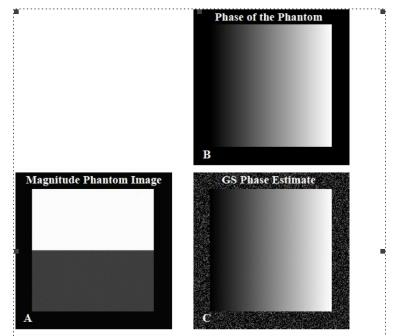 Phantom images acquired with corrected pulses were shown to have higher signal amplitude and reduced slab boundary artifacts. 47 Simultaneous multi-slice (SMS) imaging technique for radial trajectory using inter-slice shifting gradient. SMS imaging techniques utilized phase modulated RF pulses, blipped gradients, or inter-slice shifting gradients to increase the use of sensitivity information of multi-channel coils. In this work, we extended the use of inter-slice shifting gradient based SMS techniques of a Cartesian trajectory to a radial trajectory. We modulated the ratio between inter-slice shifting gradient and readout gradient (i.e. view angle) with the cosine function. In addition, we adjusted the direction of shift of each slice by adjusting the offset of cosine function, thereby increase sampling efficiency of a radial trajectory when the imaging objects need an anisotropic field-of-view. In this abstract, we propose the design of SMS RF pulses using a new method based on the small-tip angle approximation that directly constrains peak amplitude using a least-square optimization. We compare our proposed method to the equivalent phase-modulated Shinnar-Le Roux (SLR) SMS pulse with optimized phase scheduling for minimal RF power. Our proposed method provides lower simulation error than SLR-based designs at equivalent pulse lengths and same error for shorter pulse lengths that are unrealizable (in the peak amplitude sense) with the SLR-based approach. In experiment we show sharp excitation slice profiles for our SMS designs. We propose a new ultrafast multi-slice spatiotemporally encoded (SPEN) MRI technique, termed SeMSPEN, which outmatches conventional multi-slice EPI in its capability in shortening sampling time by producing multiple images in single echo train, and in lowering the specific absorption rate by segmenting the slice-selective dimension. The feasibility of this new method is verified theoretically and experimentally. The CAIPIRINHA (Controlled Aliasing in Parallel Imaging Results in Higher Acceleration), proposed for simultaneous multislice imaging, combines the multiband excitation and phase cycling techniques to reduce scan time and improve the subsequent imaging reconstruction.The total variation (TV) regularization uses an edge-preserving prior which imposes a relationship between neighboring pixels for image reconstruction. In this work, the TV regularization method is applied to further improve the CAIPIRINHA. In vivo data results demonstrate that the TV regularization is very powerful in suppressing noise, maintaining fine imaging details and reducing aliasing artifacts. The purpose was to develop and evaluate a novel approach to MR phase imaging of blood flow by combining radial cine phase contrast (radial cine-PC) with simultaneous multi-slice (SMS) technique to measure velocity in several slice planes simultaneously. Comparisons were made between SMS radial and SMS Cartesian 2D cine-PC and the velocity curves measured in cerebral vessels were similar between them. The higher acquisition efficiency of SMS radial cine PC allows for simultaneous cross-sectional hemodynamic quantification and may be useful for medical diagnoses. Simultaneous multislice (SMS) imaging is an attractive solution for accelerating MR acquisition due to its higher inherent SNR. However, further acceleration of SMS images along the phase encoding direction results in increased noise amplification. We demonstrate here the advantages of a combined virtual conjugate coil based phase-constrained SPIRiT reconstruction to minimize the g-factor penalty associated with highly accelerated SMS acquisitions. In simultaneous multi-slice imaging technique, the kernels used for unfolding the collapsed slices are estimated using integrated or separated reference scans, which require additional scan time. In this work a slice-GRAPPA calibration method utilizing the pre-scan data is developed to save the time for acquiring training data. This method has been applied to slice accelerated PROPELLER sequence. The result shows that the proposed method can correctly fit the SG kernel and reconstruct the slice undersampled images. RF pulses for Simultaneous Multi-Slice imaging (SMS) are still limited by hardware and safety requirements leading to lengthy pulse durations. In this work we apply a bi-level time-optimal control method to design a minimum time SMS refocusing pulse for a multiband factor of 15 with 1mm slice thickness resulting in a refocusing duration of 4.58ms, which is 1.7x shorter than the state of the art MultiPINS pulse. The optimized RF pulse and the corresponding shaped slice selective gradient are tested in-vivo in a T2-TSE SMS wave-CAIPI scan of the whole head in 70s. Accurate slice separation for simultaneous multi-slice acquisition continues to be challenging, especially when animal scanners equipped with relatively few receiver coil elements are used. We propose an optimized slice-GRAPPA method to reconstruct the dual-band EPI of rat brains, in which the size-optimized kernel was iteratively estimated to reduce artifacts. The reconstructed images were evaluated in terms of inter-slice leakage, g-factor, and temporal variation across the repetitions. With the proposed method, inter-slice leakage artifacts and the g-factor were reduced, and the average signal-to-noise ratio was improved. Thus, the total reconstruction accuracy was improved in the multiband EPI in a small animal study. 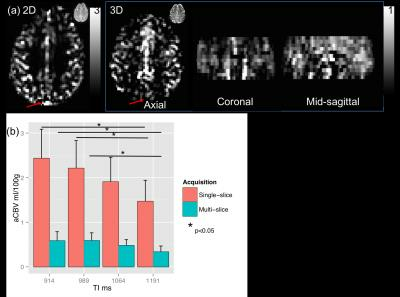 Simultaneous multi-slice (SMS) MRI has become a popular technique in both research and clinical practice, as it provides information about multiple slices at the time of a conventional single-slice measurement. For technical reasons, SMS is commonly limited to the acquisition of parallel slices. Here, we propose a new Cartesian sequence for the simultaneous excitation of orthogonal slices. We dub this technique simultaneous orthogonal multi-slice (SOMS). In this proof of concept phantom study, we reconstruct two 2-fold undersampled, simultaneously acquired orthogonal slices. We demonstrate a new imaging test that uses simultaneous multi-slice real-time MRI during continuous positive airway pressure (CPAP) to quantify upper airway neuromuscular reflex and passive collapsibility. Both are measured using cross-sectional area fluctuation during abrupt changes to CPAP. We applied this test to patients with obstructive sleep apnea (OSA) and healthy controls. Subjects with OSA showed 3-5x higher airway area fluctuation compared to healthy volunteers, and this difference was statistically significant (p < 0.05). Neuromuscular reflex and area fluctuation varied greatly among the OSA patients, suggesting a potential spectrum of active/physiological and passive/anatomical factors contributing to OSA. MR Fingerprinting (MRF) based Arterial Spin Labeling (ASL) has been recently proposed as a new approach to measure multiple hemodynamic parameters in a single scan. However, the previous implementation of MRF-ASL has several limitations, including a single-slice-only acquisition, incomplete optimization of the sequence, and an absence of comparison with existing techniques such as Look-Locker ASL and dynamic-susceptibility-contrast (DSC) MRI. In this work, we conducted a series of six studies to fill these technical gaps: we optimized several key imaging parameters in MRF-ASL and compared the results to existing methods. 49 Improved Accelerated Model-based Parameter Quantification with Total-Generalized-Variation Regularization. Incorporating TGV-regularization to accelerated model-based parameter-quantification can lead to improved image quality, however, adds non-differentiability to the problem which poses a problem for commonly used first order optimization methods like non-linear Conjugate-Gradient. The proposed method overcomes this limitation by handling the problem within a Gauss-Newton-framework and applying a Primal-Dual-algorithm to solve the inner TGV-regularized problem. Numerical simulations exhibit high agreement to references for four different parameter mapping problems up to 18-fold acceleration. In-vivo results for T1-VFA and T2-MESE models strengthen these findings. The proposed method offers huge acceleration potential for model-based parameter-quantification with similar quantification quality as fully sampled data. 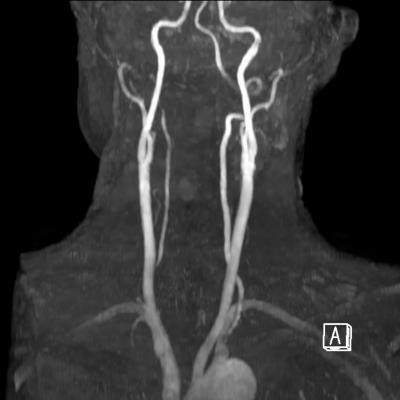 Compressed sensing (CS) can accelerate time-of-flight magnetic resonance angiography (TOF MRA) of the neck. The whole length of carotid arteries from the aortic arch to the skull base was scanned in 2 minutes with an acceleration factor of 7.5. Iterative reconstruction that exploits regularization in 3 spatial directions required less than 3 minutes on a GPU. The degree of stenosis at carotid bifurcation for 22 patients was subjectively evaluated on maximum intensity projection images. Results of CS accelerated TOF MRA and conventional TOF MRA were compared with stenotic rates measured by ultrasound, and showed an excellent correlation. MRI becomes an important tool in the study of speech, in particular in the understanding of articulatory gestures. 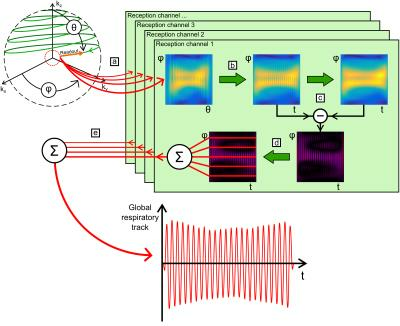 Distributed Compressed Sensing and Projection Onto Convex Sets are used to reconstruct dynamic sequences of vocal tract images at 33 frames per second with a spatial resolution enabling the extraction of vocal tract contours. 15 seconds long, spoiled gradient echo sequence acquisitions with pseudo random Cartesian sampling were recorded while subjects were repeating sentences. 76 sentences were recorded, representing the majority of the French phonemes. 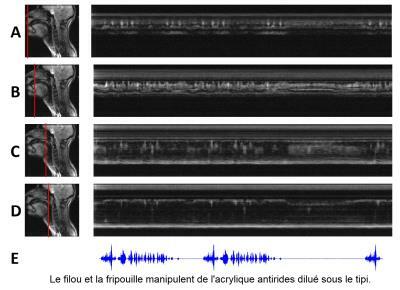 High frame rate dynamic vocal tract MRI will enable the study of coarticulation in French. Non-Cartesian multi-shot sequences (e.g. 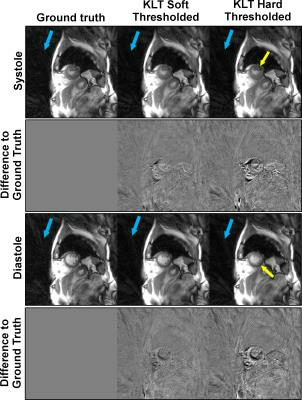 spiral) offer several benefits over Cartesian counterparts in the context of high spatial resolution diffusion weighted imaging (DWI), including reduced B0 & T2* artifacts, as well as improved SNR resulting from lower TE. However, their main drawback of the above scheme is the sensitivity of the multi-shot imaging to motion artifacts. To achieve motion compensation, the multi-shot reconstruction methods rely on a phase-calibration procedure, during which an estimate of motion induced phase map is computed. Not only is the phase-calibration step time consuming, it also involves heavy optimization of parameters. 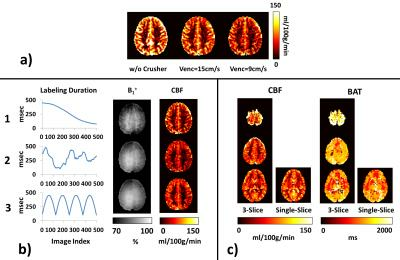 The main focus of this work is to develop a phase calibration-free motion-compensated reconstruction for multi-shot non-Cartesian diffusion imaging. The proposed reconstruction framework for MR-Fingerprinting (MRF) combines a low rank approximation of the signal's temporal evolution with the alternating direction method of multipliers. This general framework allows for incorporating parallel imaging and compressed sensing. The low rank approximation of the signal's temporal evolution reduces the number of fast Fourier transformations significantly and adresses the non-convexity of the MRF-reconstruction problem. Overall, the convergence is improved and undersampling artifacts are reduced, resulting in a fast, robust and flexible reconstruction framework. This work implements a Magnetic Resonance Fingerprinting (MRF) reconstruction that accounts for the presence of multiple compartments in a voxel. We estimate the contributions of the different tissues by incorporating a sparse-recovery method, based on reweighted-l1-norm regularization, within an iterative procedure that fits a multi-compartment model to the measured k-space data. The proposed approach is validated with simulated data, as well as with a controlled phantom experiment. In addition, we present preliminary results on in-vivo measurements of a brain. 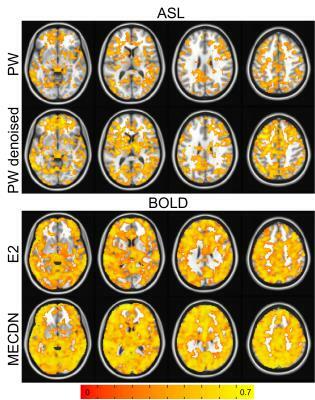 Myelin water fraction (MWF), which reflects myelin content, can be derived from multiple T2 weighted images. In this study, compressed sensing was used to accelerate 3D GRASE myelin water imaging in simulated experiments using a Cartesian undersampling scheme. Group-sparse reconstruction that exploits the correlation between the echoes, and different echo sampling schemes, were tested. Group-sparse reconstruction was found to improve the overall data quality, and identical phase encode undersampling for each echo was found to improve MWF map quality. Using both, MWF map quality remained usable for up to 4x acceleration. 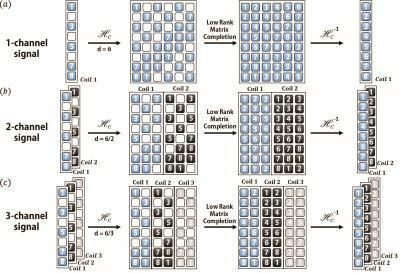 An imaging analytic is proposed that efficiently reconstruct high-resolution 4D MR images using GPU computing. 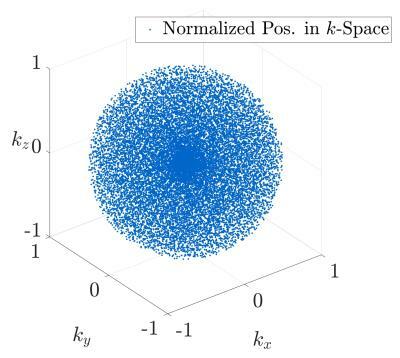 Modeling k-space data low dimensionality with low PARAFAC rank of tensors, the correlation across different dimensions are captured via tensor subspaces, sequentially learned from the subsampled data, to impute the missing k-space entries. The novel analytics gain considerable computational saving relative to the state-of-the-art compressive sampling schemes, while achieving failry similar image quality. Subspace constrained T2 mapping uses PCA to reconstruct a few principal components instead of all the echo train images before T2 fitting. The temporal (contrast) subspace in these methods is estimated either from acquired training data or via training curves from a signal model. Typically, a single global PC basis is used for all the contrast signals. In this work we present a T2 mapping method based on non-local clustering of signal relaxation curves and tailor the PC bases for the curves in each cluster and compare it with the global PC basis approach. A motion-guided low-rank plus sparse (L+S) approach for reconstruction of respiratory motion fields is presented for dynamic MRI of the lungs with high spatiotemporal resolution. Motion-guided L+S represents a paradigm shift where motion fields that describe deformations between respiratory phases are reconstructed instead of the respiratory phases themselves. The technique is demonstrated for normal and deep breathing imaging and compared against standard L+S reconstruction. We introduce an image manifold smoothness regularization, coupled with spatial regularization, for high-resolution free-breathing and ungated cardiac cine imaging. Prior work in this area relied on additional navigators within each image frame to estimate the manifold structure. In this abstract, we focus on eliminating the need for navigators, which will provide improved sampling efficiency. 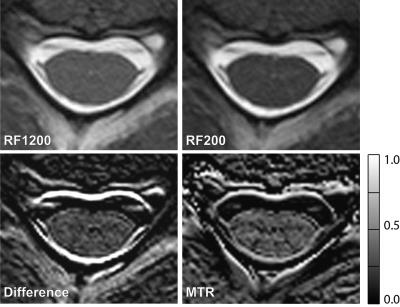 Temporal resolution is an important factor in dynamic enhanced contrast (DCE) MRI. Time-resolved angiography with interleaved stochastic trajectories (TWIST) has been widely used due to its improved temporal and spatial resolution. However, the temporal resolution of TWIST imaging is not a true one because of the view sharing. To provide more improved temporal resolution, we proposed a novel reconstruction algorithm based annihilating filter-based low rank Hankel matrix approach (ALOHA) which exploits the fundamental duality between sparsity in transform domain and low-rankness of Hankel matrix constructed using k-space data. Experimental result using in-vivo data showed the significantly improved temporal resolution than the conventional reconstruction. A novel compressed sensing temporal regularizer, Total Generalized Variation is introduced to enable accelerated temporal imaging. This regularizer eliminates the staircase artifacts typically observed when using a Total Variation regularizer. 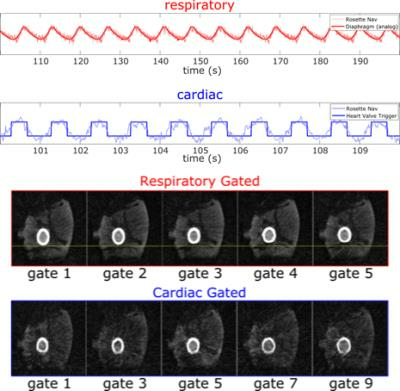 In this work a joint cardio-respiratory motion estimation technique is introduced for the compensation of both the respiratory and cardiac motion of the heart during free-breathing cardiac MRI examinations. The proposed technique is combined with an extra-dimensional reconstruction scheme in which respiratory and cardiac motions are resolved. Initial results for 2D cine cardiac MRI are presented for synthetic and real data. Robust data consistency using the Huber norm is proposed for compressed sensing radial MRI to reduce artifacts associated with outliers in the acquired data that cannot be removed by the sparse reconstruction. System imperfections such as chemical shift can introduce this type of large data distortions, or outliers. The quadratic shape of the usually employed Euclidean norm for data consistency is very sensitive to very large errors. In the proposed method, named RObust Golden-angle Radial Sparse Parallel MRI (ROGRASP), the Huber norm enables large errors to remain in the data discrepancy, not transferring them to the reconstructed image. In vivo acquisitions with outlier-contaminated data illustrate this improvement in quality for free-breathing cardiac MRI. 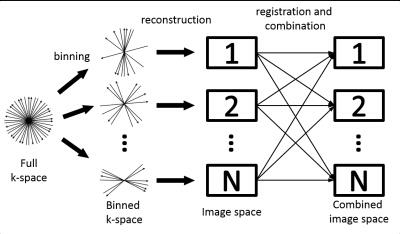 In the presented work, a compressed sensing approach is introduced to calibrate k-t space parallel imaging reconstruction. 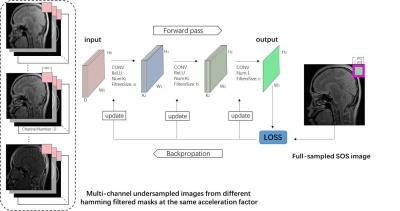 This approach removes the need for calibration data and improves image reconstruction using data sparsity associated with narrow bandwidth of physiological motion signals. The new approach is used to enable real-time neonatal chest MRI. It is experimentally demonstrated that real-time imaging can provide high-quality cardiac and pulmonary images for improved clinical diagnosis in premature babies. An online real-time reconstruction technique that combines compressed sensing with principal component analysis (CS-PCA) was developed for the purpose of adaptive radiotherapy using our Linac-MR system. Our technique uses a database of images, acquired prior to an incoherently accelerated acquisition, to fill in the missing lines of k-space using PCA. Our technique can reconstruct images ranging from 5-20 frames per second with minimal artefacts. Many image quality assessments (IQA) have been proposed for natural image assessment but few reports have applied them to MRI images, much less to reconstructed images by compressed sensing (CS). Ten subjects were scanned for time-of-flight MR angiography (TOF-MRA), retrospectively under-sampled, and reconstructed by CS. The reconstructed images were evaluated subjectively by radiologists and quantitatively by several IQAs. Structural similarity, scale-invariant feature transform and natural image quality evaluator correlate well with radiologists’ perception and hence can be used to determine the optimal parameters for CS of TOF-MRA. 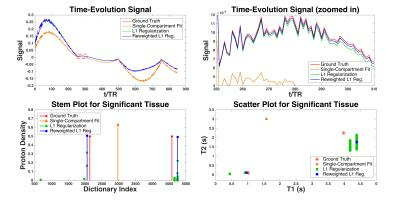 This work describes the use of ICTGV regularization for highly accelerated T1 and T2 quantification. 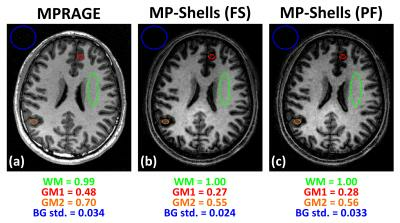 For increased robustness of quantitative MRI multiple parameter encodings are necessary. With conventional encoding, this strategy increases scan time, in particular for T1. By using appropriate subsampling and iterative image reconstruction with ICTGV regularization, high quantification quality is achieved up to an acceleration factor of 16. To improve characterization of myocardial infarction using high-resolution multicontrast volumetric imaging, this work presents a new compressed sensing parallel imaging reconstruction using low rank and spatially varying edge-preserving constraints. 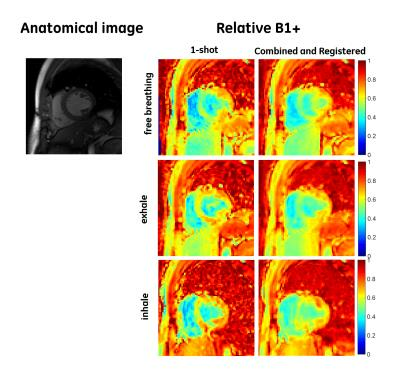 The proposed method was validated in vivo in preclinical studies on pigs with chronic myocardial infarction with comparison to histopathology, demonstrating the promise of robust reconstruction of fine image detail from a single breath-hold multicontrast acquisition at an isotropic resolution of 1.5mm. In many clinical settings, multi-contrast images of a patient are acquired to maximize complementary information. With the underlying anatomy being the same, the mutual information in multi-contrast data can be exploited to improve image reconstruction, especially in accelerated acquisition schemes such as Compressive Sensing (CS). This study proposes a CS-reconstruction algorithm that uses four regularization functions; joint L1-sparsity and TV-regularization terms to exploit the mutual information, and individual L1-sparsity and TV-regularization terms to recover unique features in each image. The proposed method is shown to be robust against leakage-of-features across contrasts, and is demonstrated using simulations and in-vivo experiments. MRI can encode clinically important information in the image-phase, thus has great potentials to extend its capability for clinical applications. However, if phase references are not available, the multi-coil phase combination using the weighted average suffers from dominant signal losses coming from phase cancellations due to uncompensated coil-dependent phase offsets. 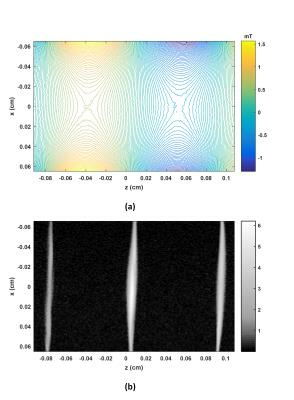 In this work, we developed a self-calibrating multi-coil phase combining method which does not require any additional scans for phase references. When applied to a single-point Dixon imaging, we verified the proposed method could successfully estimate the global phase-map with the minimal signal loss only using a single-scan image. We propose a novel approach to designing optimal k-space sampling patterns for sparsity-constrained MRI. The new approach, called OEDIPUS (Oracle-based Experiment Design for Imaging Parsimoniously Under Sparsity constraints), is inspired by insights and methods from estimation theory and the statistical design of experiments. Specifically, OEDIPUS combines the oracle-based Cramér-Rao bound for sparsity-constrained reconstruction with sequential greedy algorithms for observation selection. We demonstrate that OEDIPUS can be used to deterministically and automatically generate k-space sampling patterns that are tailored to specific hardware and application contexts, and which lead to better reconstruction performance relative to conventional sampling approaches for sparse MRI. 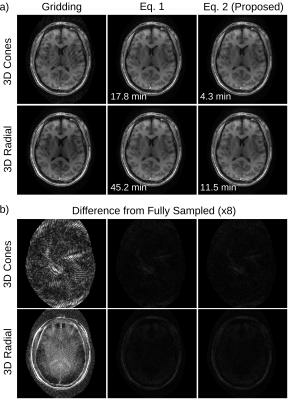 A novel reconstruction method exploiting high-order generalized series and temporal sparsity constraint has been presented for sparsely-sampled DCE-MRI. The method uses a static reference to model high-resolution anatomical structures while extrapolating the missing k-space and imposing the sparsity of the time frame difference. Our initial experience with human breast DCE-MRI data shows that the proposed GenSeT method yields more accurate spatiotemporal dynamics and PK analysis than the conventional zero-filling and TWIST reconstruction methods. Further validation of the method as a useful reconstruction approach for sparsely-sampled DCE-MRI is warranted in a larger cohort and with data from different organs. 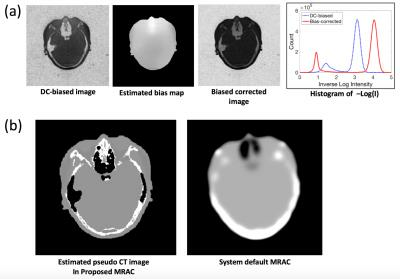 Attenuation correction (AC) is needed for an accurate PET image quantification in brain PET/MR. Regular MRI cannot distinguish between different tissue types based on electron density, thus, Zero Echo Time (ZTE) has been used to segment bone, air and soft tissue. Furthermore, a correlation has been established between histogram normalized ZTE intensity and measured CT density in Hounsfield Unit (HU) in bone on a CT-MR database of 16 patients. 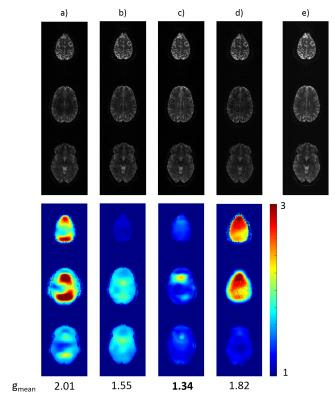 The patient-specific AC map generated by combining ZTE-based segmentation and linear scaling of normalized ZTE signal into HU showed to be a good substitute of the measured CT-AC map in brain PET/MR. Abdominal PET-MR scans commonly combine free-breathing PET with breathhold or respiratory-triggered MR scans (T1/T2-weighted). This ensures high MR image quality but can lead to PET images impaired by motion blurring. Furthermore, PET can suffer from artefacts close to tissue-lung interfaces due to misalignment of breathhold MR-based attenuation correction (AC) information used for free-breathing PET. 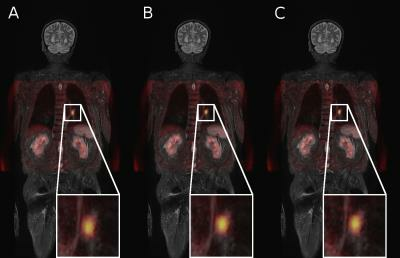 Here we present a free-breathing MR-technique which yields motion-compensated 3D T1-weighted and T2-weighted MR images. Respiratory-resolved AC maps and motion compensation improved uptake values (125±131%) and resolution (22±16%). Respiratory motion information is obtained with an accuracy of 1.3±0.1mm without an increase in scan time. 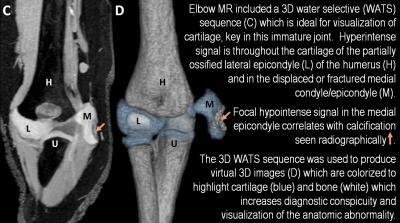 Recently, ultrashort TE imaging based MR-based attenuation correction (MRAC) has been proposed in literature to overcome the intrinsic difficulty in MRI to resolve bone contrast and hence enable more reliable estimation of attenuation map. However, the long acquisition time required for UTE imaging still remains challenging. In this study, we propose a novel, rapid dual echo method for UTE based MRAC, which allows segmentation of bone, air, fat, and water with high spatial resolution (1mm3) in a single scan with extremely short scan time (35sec). 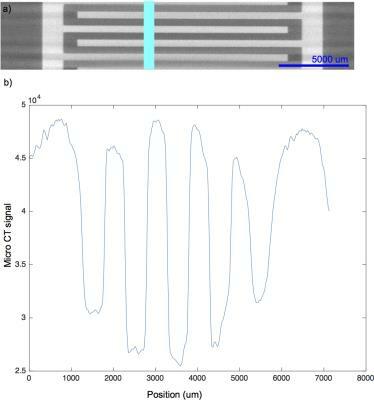 Attenuation correction remains a challenge in simultaneous PETMR, as MR signal is not directly related to attenuation. This is particularly problematic in PETMR studies of the brain, where accurate radiotracer quantification is extremely important. Here, we present a method for generating individual-specific transmission data for attenuation correction from an input MPRAGE MR volume. The method uses an atlas of matched MPRAGE and transmission images in order to achieve this. Our method does not add to scan time, as do common MR-based methods, and directly yields attenuation data for PET energies, unlike CT-based methods. Shutter-speed modeling (SSM) of DCE-MRI data allows for estimation of the mean intracellular water molecular lifetime (τi), which has been suggested to be associated with tissue metabolic activity. 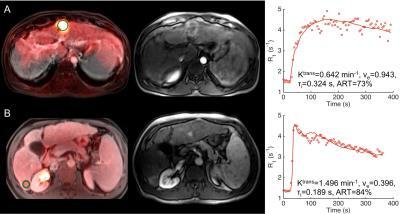 In this study, we assessed the correlation between SSM DCE-MRI parameters and FDG-PET uptake in hepatocellular carcinoma (HCC) lesions. While Ktrans did show a significant negative correlation with the standardized uptake value (SUV) in the HCC lesions, τi was not significantly associated with FDG uptake. Our preliminary findings suggest that τi may not be associated with the up-stream tumor glucose metabolism as measured by FDG-PET. 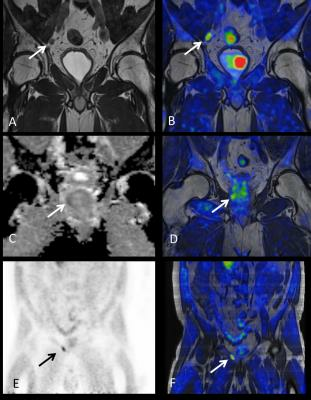 Simultaneous PET/MRI has the potential to improve the detection accuracy in recurrent prostate cancer, since it combines the excellent soft-tissue contrast of MRI with the high molecular sensitivity of PET in one imaging session. The aim of this observational study is to assess the detection rate of recurrent prostate cancer by simultaneous 18F-Fluciclovine PET/MRI. We demonstrate that18F-Fluciclovine PET/MRI can detect suspicious lymph node, prostatic and bone lesions in patients with a wide range of PSA levels and that the number of equivocal findings is reduced when MR images are evaluated in conjunction with PET uptake. .
Dual-echo UTE MR sequences are widely used to estimate PET attenuation coefficients in simultaneous PET/MR imaging. However, due to susceptibility artefacts, air cavities in the head together with brain tissues and bones, can be misclassified, especially around air-tissue interface regions. 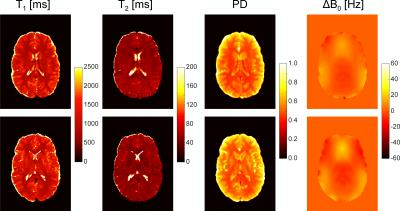 In this work, we propose an SPM-based air and background segmentation method to improve the PET attenuation correction for simultaneous PET/MR imaging of the human brain. We compare air segmentation methods for more accurate air classification using an in-vivo MR-PET dataset and demonstrate improved PET image reconstruction accuracy. A new PET/MR method for MR-based motion correction of PET data was set up and evaluated in a clinical study to assess the potential gain of significance and visibility of lesions in the thorax for a free-breathing patient. The new method (MoCo) was applied to 20 patients and compared to reconstructions of a single respiratory state (gated) and the total non-corrected (static) dataset. Having a comparably high statistical confidence like the static PET imagery, the motion-corrected reconstruction shows superior image quality with sharper depiction of moving lesions and thus may facilitate the diagnosis of thoracic pathologies in routine PET/MR applications. 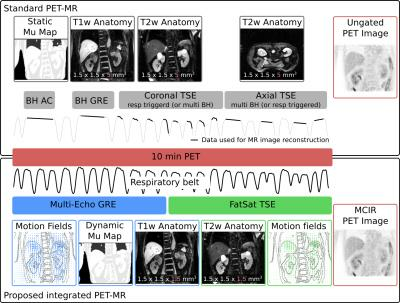 A major advantage of hybrid PET/MR systems is the radiation-free high spatial and temporal resolution of cardiac MR imaging that can be used to estimate respiratory and cardiac motion present during PET data acquisition. This information can be incorporated into algorithms to correct for the effects of motion in the PET data to reduce blurring and increase target-to-background ratios of PET hotspots. In this work, we demonstrate a method for respiratory and cardiac motion correction in patients with cardiac sarcoidosis. Due to the recent availability of simultaneous PET-MR, there has been much interest in MR-based motion correction for PET imaging. A key component of any such scheme is a mechanism for tracking respiratory and cardiac motion phases throughout the entire exam. In this work, we present a robust, automated approach whereby respiratory and cardiac motion information is jointly encoded with rosette navigators and decoded via independent component analysis (ICA). This approach obviates the need for any external motion tracking devices (e.g. bellows or ECG) and requires just a contrast-neutral, self-refocused navigator echo (≈2ms) per repetition time and so may be easily incorporated into many clinical sequences. 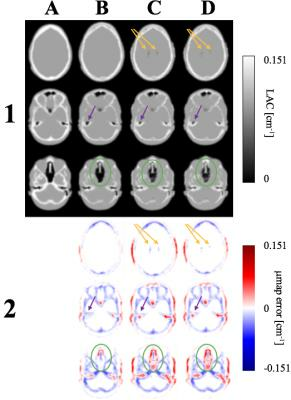 Accurate measurement of the arterial input function (AIF) is essential in quantitative analysis of cerebral blood flow (CBF) using 15O-water PET imaging. The time-of-flight enabled SIGNA PET/MR scanner (GE Healthcare, Waukesha, WI, USA) provides high quality PET images, which can be used for non-invasive Image Derived Input Function (IDIF) estimation. AIF was measured using a proposed IDIF method on 4 patients and the results were compared with the gold standard, arterial blood sampling. The comparison shows excellent correspondence between IDIF and blood sampling, thus validating the IDIF method. Today, when whole-body PET-MRI datasets are analyzed, the data is typically reduced to a few a priori specified measurements. New tools are developed in an attempt to utilize the full potential of large whole-body datasets. The purpose of this work was to build a preliminary whole-body atlas, containing both morphological (fat and water MR) and functional (FDG-PET) information on normality. 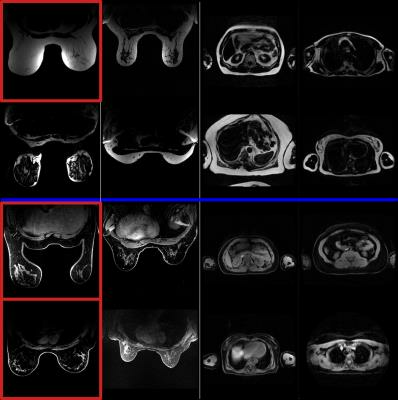 An atlas was built out of 30 subjects using an integrated PET-MRI system together with an efficient registration method for fat-water MR images. The atlas was used in a proof-of-concept anomaly detection in FDG-PET using a pointwise t-test, which successfully detected anomalies in our test subject. Multi-parametric imaging, such as joint relaxometry and diffusion, can allow for a time-efficient measurement of several parameters of interest. However, it is unclear how best to make use of valuable scanner time when using such novel imaging techniques. In this work, we explore how Bayesian experimental design can be used to derive a maximally time-efficient joint imaging experiment. MR fingerprinting (MRF) studies have been performed using heavily undersampled spiral acquisitions, which constantly rotate and use uncorrelated aliasing to fit quantitative T1 and T2 maps. On top of the usual spiral sensitivity to off-resonance, the undersampling used in MRF requires a slowly varying signal evolution to “see through” the aliasing artifacts. 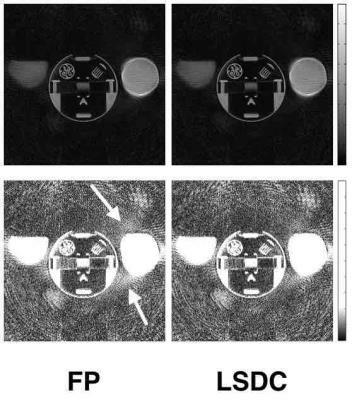 Echo-planar imaging (EPI) would avoid these aliasing issues while still having a short measurement time due to a single-shot acquisition and parallel imaging acceleration. In this study, a single-shot EPI sequence is combined with fingerprinting techniques to obtain T1 and T2 maps similar to those from spiral fingerprinting. 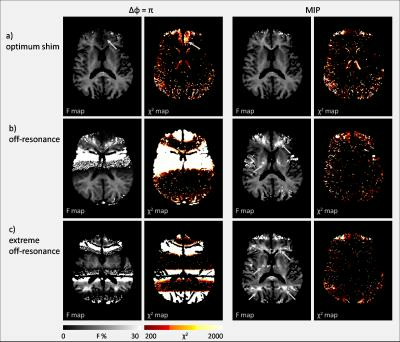 In this study we developed spiral-based MRF sequences for fast T1 and T2 mapping of mouse brain at 7T. A variable density spiral trajectory that fully sampled the inner 10×10 k-space with 4 interleaves enabled up to 6-fold acceleration for both MRF-bSSFP and MRF-FISP sequences, corresponding to a 3-min scan to acquire 1024 time frames for simultaneous T1 and T2 mapping. 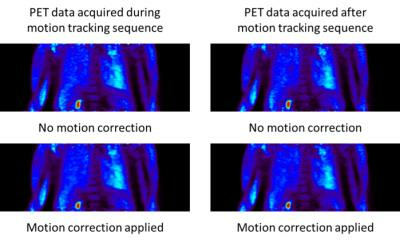 The introduction of simultaneous PET-MR provides new opportunities for motion tracking and correction during PET imaging. 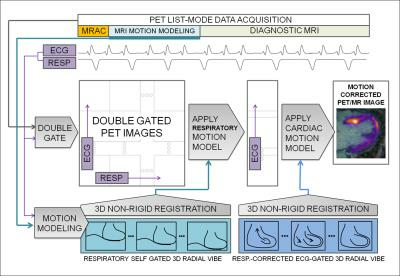 The ideal clinical workflow for a PET-MR exam would allow for PET data to be continuously acquired alongside any desired MR sequences and to reconstruct a motion-corrected PET image utilizing the entire dataset. In this work we combine a surface coil driven by an external signal generator with an MR motion model to navigate PET data during an entire PET-MR exam. We demonstrate the approach on one human subject that underwent a PET-MR exam. T1rho is promising for early detection of liver fibrosis. However, the richness of blood vessels in the liver coupled with respiratory motion makes T1rho measurement prone to errors. In this work, we propose a pulse sequence to simultaneously obtain a T1rho and a T2 map of liver in a single breathhold with black blood effect. Current techniques for skull attenuation correction in PET-MRI provide indirect estimates of cortical bone density, leading to inaccurate estimates of brain activity. Here we propose an alternate method based on the detection of hydroxyapatite crystals by 31P-MRI, providing individual and quantitative assessment of bone density. 31P-MRI was performed in rodent to estimate the µ-map of the skull. FDG-PET data were acquired in the same animal and reconstructed with 31P-based attenuation correction, demonstrating proper distribution of 18F activity throughout the brain. We describe and evaluate a method for intensity non-uniformity correction of whole-body fat-water MR data acquired with both surface and body coils on a 3T PET/MRI system. The proposed method consists of two steps. 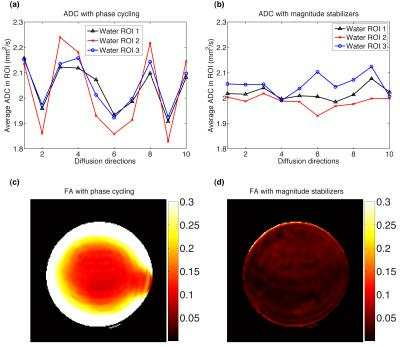 Abrupt station intensity changes are first supressed, followed by correction of smooth intensity changes using fat and water fraction information. Visual and quantitative evaluations of 42 corrected fat-water datasets show that the method gives improved adipose and lean tissue uniformity for both surface and body coil acquisitions. This renders the data suitable for continued analysis in a whole-body imaging framework. Multiple Instantaneous Switchable Scans (MISS) is a type of interleaved scan method. In our study of prostate MRI, we combined the 3D-T2W and DWI by MISS into one scan, both of which are essential sequences for PIRADS v2. The combined sequences improved the scan efficiency (6min to 4min30s). The image quality and lesion display of MISS is similar to conventional T2W and DWI. The 3D-T2W in MISS showed better performance of seminal vesicles and lesion contrast and allowed for interactive multiplanar reformation. A penta-contrast imaging sequence that generates proton density (PD), T1, T2, T2* and FLAIR images in a single scan is developed. Compared to conventional imaging sequences, the scan time is reduced by 50 %. Additionally, the new method generates T1 and T2 maps. Magnetic resonance fingerprinting (MRF) has shown exceptional promise for simultaneous quantification of T1 and T2, based on numerous spiral readouts. 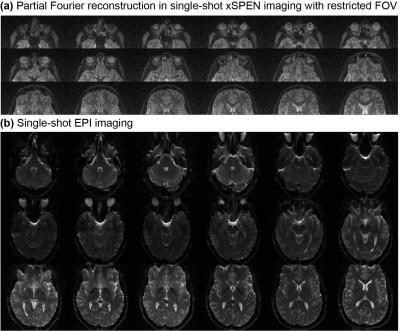 We propose an implementation of the MRF paradigm for quantitative imaging using spoiled echo-planar imaging (EPI) with Cartesian readout for simultaneous assessment of T1 and T2* within 10s. Joint T1 and T2* parameter-maps acquired in phantoms with the proposed MRF method are in good agreement with reference measurements and demonstrate high quality in-vivo. This approach offers a rapid supplement to the non-Cartesian MRF portfolio, with potentially increased usability and robustness. We compare the fields measured by a field camera to the fields obtained from B0 mapping at 9.4T. The B0 maps have higher spatial resolution and are therefore taken as a benchmark. We analyse the loss of spatial fidelity due to the lower spatial samples of the field camera and compare two different field probe position calibration and optimisation methods that would help alleviate the problem of discrepancies between field monitoring and field mapping. 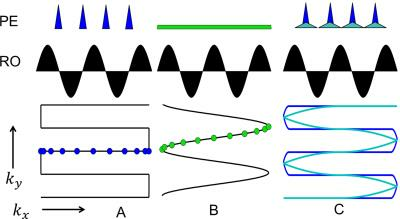 B0 field inhomogeneities can negatively impact the image acquisition process, cause artifacts such as ghosting and blurring and introduce physiological noise in fMRI time series. It is common to address the static inhomogeneity components by using shim coils. Physiological motion during the acquisition can lead to temporal variations in the field configuration. Dynamic shimming necessitates fast, real-time estimation of B0 distortions. In this work, we augment projection-encoded FID readouts with a simple projection-based spatial encoding and train a neural network to learn the mapping from projection FIDs to field maps, which we obtain using a double-echo EPI sequence. A method is presented to perform B1+-mapping simultaneously with high dynamic range and high SNR by optimally combining data from acquisitions with different acquisition parameters. Reconstruction of the B1+-maps is performed using dictionary matching methods. 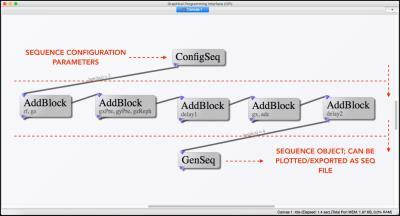 This approach is applicable to various B1+-mapping sequences. Examples based on the AFI sequence are shown in both numeric simulations and a phantom experiment in the presence of a severe B1+ hot-spot. The performance of the proposed methods largely exceeds that of classic AFI sequences, simultaneously matching low-flip-angle acquisitions in dynamic range and high-flip-angle acquisitions in SNR, at identical acquisition times. Measuring GIRF using field probe and chirp gradient waveform is an efficient method to characterize the gradient behavior. We demonstrate that by measuring GIRF for each channel we are able to predict the response of simultaneously driven 12-channel gradient operation. Full characterization of the gradient system can be used to detect suboptimal matching of the amplifier and can be used to achieve desired performance also in such complex systems as matrix gradient coils. Diffusion weighted EPI is susceptible to distortions due to multiple causes, and the amount of distortion is dependent on many interacting factors. Hence no good methodology currently exists for assessing and characterizing these distortions. In this work an EPI sequence is modified to include Spatial Modulation of Magnetization (SPAMM), a preparation technique that produces tagged grid lines in the imaged volume. 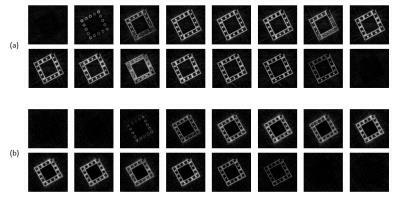 This sequence is acquired to measure induced distortion in several phantoms in different coils with different sequence options, measuring distortion as it varies with parallel imaging acceleration, diffusion weighting direction, and susceptibility of various phantom materials. For reconstruction of MRI from raw data, the k-space trajectory is needed. We propose to measure this simultaneously with the MRI signal using novel hardware and the scanner itself. As a first step, we demonstrate real-time processing of a gradient pickup coil voltage during scanning, modulation of this signal to a frequency within the MR acquisition bandwidth, and signal extraction from MR raw data. 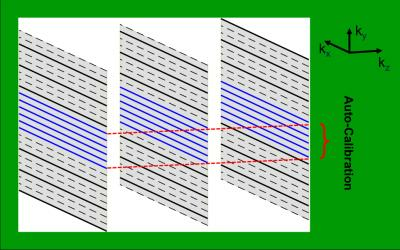 This principle is applied to measure k-space trajectories inductively and perform image reconstruction based on this. The resulting images have comparable quality to images reconstructed using nominal k-space trajectories. The method can potentially provide generic image reconstruction with limited hardware, even for challenging and dynamically updated gradient schemes. Due to imperfect laser positioning, actual isocenter slicepositions can deviate from manufacturer indication. Using MRI as tool for dose planning in MR guided radiation therapy, the geometric correct position of MR-slices is an essential quality parameter that can affect dose calculation and definition of the planning target volume (PTV). To evaluate the magnitude of the deviation of the actual slice position from the true isocenter of the scanner, a phantom study was performed. Scanner-dependent deviations in isocenter slice position occurred in the range of 1 mm - 5 mm. Accurate B1 measurement is important in many MR related applications. In this study, we proposed and optimized a phase-sensitive approach for B1 mapping that relies on a multi-gradient-echo sequence with two successive orthogonal RF pulses used for signal excitation. We also proposed optimized methods for combining multi-channel data, allowing for optimal parameters’ estimation. The method was validated on phantoms and tested on human participants. By applying this method on SMART (Simultaneous Multi-Angular Relaxometry of Tissue) MRI, we reaffirmed the importance of the B1 correction for quantifying biological tissues relaxation and magnetization transfer parameters. The gradient impulse response function (GIRF) completely characterizes the gradient system as a linear and time-invariant (LTI) system, and has recently been used to correct for distorted k-space trajectories in image reconstruction. We now report on the implementation of a GIRF-based pre-emphasis, which is resulting in gradient waveforms already matching the desired k-space trajectory and rendering post-corrections obsolete. The method was successfully tested in a sequence with modulated phase-encoding gradients, as for example used in Wave-CAIPI. 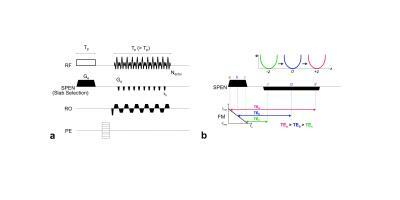 Hall effect sensors can be used to monitor the spatiotemporal field dynamics. However, measurement of the z component of the magnetic field (Bz) requires very large dynamic range for the Hall effect sensors due to superposition of encoding fields with main magnetic field (B0). Instead, we propose to measure the transverse components of the magnetic field in several spatial positions to reconstruct spatiotemporal dependency of Bz and we have demonstrated reconstruction of the first order spherical harmonic field distributions. Radiofrequency (RF) field inhomogeneities affect image quality while performing body and cardiac imaging especially at high field strengths. 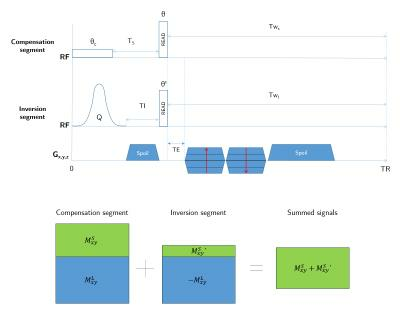 RF shimming and quantitative MR applications such as T1 mapping can potentially benefit from an accurate knowledge of variations of the transmitted RF field (B1+). The purpose of this work is to investigate spatial homogeneity of the B1+ in the myocardium at 3.0T. For this study, we developed a prospective ECG-gated method based on DREAM (Dual Refocusing Echo Acquisition Mode). The presented approach allows free breathing multi-shot acquisition B1+ mapping and its feasibility is shown in vivo. The German Ultrahigh Field Imaging network (GUFI, www.mr-gufi.de) is a user group of 13 German and neighboring sites that all operate a UHF (7T or 9.4T) MRI system. Due to the lack of common quality assurance (QA) procedures for UHF, GUFI started an initiative to unify QA procedures at these sites. A QA phantom and measurement protocol were developed especially for UHF that is currently being rolled out to all member sites. The QA data allow monitoring of individual system performance based on long-term data analysis or by comparison to pooled data from all sites. Detection of artefact and its automated correction is an active area of MRI research. The aim of this study is to evaluate MR system/sub-system degradation and detection of root cause for image quality degradation using Magnetic Resonance Fingerprinting (MRF). The method is demonstrated on Terranova, an earth’s field MR imager as part of the preliminary studies. The 3 major coils: polarizer, gradient and Audio Frequency (AF) coils were considered for degradation evaluation. A dictionary similar to MRF with 64 entries for different ranges of inputs was generated. It is shown that based on dictionary a decision can be made about the status of the system. We proposed a method to decouple field probes and to improve the accuracy of dynamic magnetic field estimation. A sensitivity matrix of probes was measured and to decouple NMR signals. 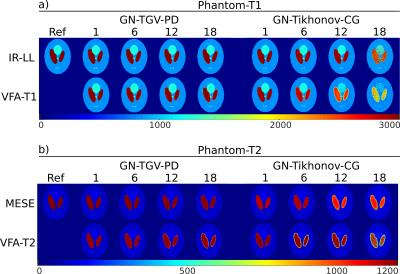 Diffusion weighted phantom images with off-resonance characterized by decoupled probes had a more invariant structure than by coupled probes when diffusion sensitivity gradients along different directions were applied. The phantom image reconstructed with field disturbances estimated from decoupled probes also shows a more homogeneous background than from coupled probes. 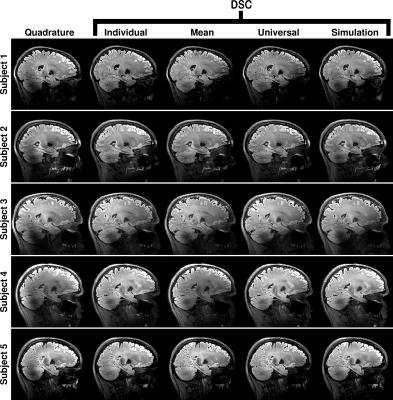 Human brain images also demonstrated the improved image quality when decoupled probes were used. RF shimming for multi-transmit systems is commonly performed by phase-only shimming. Improved B1+ homogeneity is reached by phase-amplitude shimming but this requires knowledge of the B1+ magnitude distributions. For cardiac imaging at 7 Tesla, the acquisition of these distributions is challenging. We present a DREAM-based acquisition series to reconstruct B1+ magnitude maps in the heart. This method is applied to homogenize the transmit field for three subjects using phase-amplitude shimming. Results demonstrate a clear improvement of transmit field homogeneity in the heart in comparison to phase-only shimming without B1+ magnitude information. We studied the effect of encoding imperfections due to gradient errors with a focus on their interaction with $$$B_0$$$ inhomogeneities. Using a simulation framework, we retrospectively sampled data using k-space trajectories of two fast imaging sequences and compared reconstructions based on nominal, gradient impulse response (GIRF) predicted and measured (ground-truth) trajectories for spiral and readout-segmented EPI sequences. We found that the detrimental impact of trajectory imperfections on image quality is strongly amplified by $$$B_0$$$ inhomogeneities, especially for non-Cartesian trajectories. Furthermore, we confirmed that GIRF-predicted trajectory based reconstructions (requiring only a one-time calibration) allow effective artifact reduction. In this work we evaluate the performance and the robustness of an algorithm for the reconstruction of B1+-maps out of highly accelerated Bloch-Siegert data. The algorithm is based on variational modeling with a problem specific regularization approach. We evaluate the influence of different sampling patterns on the achievable accuracy and sampling efficiency and the influence of both regularization parameters on the final result. All results are compared to the fully-sampled reference using conventional reconstruction. We can show the general robustness of our algorithm and the most effective sampling pattern for this purpose. Linear-array resolution inserts are considered for evaluations of MRI scanner performance in terms of spatial accuracy. 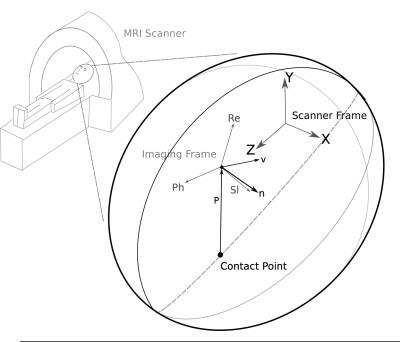 The linear design allows for simple computer analysis of MR images, which can be used for a quick and quantitative comparison of MRI systems. It is well known that the bSSFP signal is highly dependent on the precession frequency off-resonance value at each pixel. The bSSFP signal can be modeled as an ellipse in the complex plane that rotates about the origin, with the degree of rotation depending on the regional off-resonance value. If a specific point on the axis of the ellipse could be localized, the phase of that point could be used to produce a field map. Xiang and Hoff came up with a geometric solution (GS) which removes banding artifacts by estimating a consistent cross point within the ellipse. The goal of this study was to characterize the k-space trajectories of a spiral echo train pulse sequence using a dynamic field camera. The spiral trajectories were quite repeatable, with typical measured error less than 0.01% of the maximum k-space magnitude. This was true for constant-density, dual-density, and spiral-in/out trajectories. A somewhat larger error was typically observed in the first echo. Overall, this study demonstrates that 3D spiral echo train imaging using the same k-space estimation method for all echoes was sufficient to achieve high image quality. 117 Assessing changes in MRI measurands incurred in a scanner upgrade: Is my study comprised? Scanner upgrades due to software and hardware changes are an inevitable part of MR research and, without quality assurance protocols, can jeopardize studies. We used two standardized phantoms to evaluate change in T1 relaxation time and ADC measurements on a system that underwent an ‘everything but the magnet’ upgrade. Post-upgrade, the ADC measurements are comparable or better than the pre-upgrade measurements, while T1 measurements (VFA and IR) are affected by the upgrade. Upgrades can have unintended consequences, and we recommend the development of standardized quality assurance protocols that test not only contrast, but also quantitative measurements to identify variations and enable corrections. Siemens' latest 3 Tesla scanner, the Magnetom Prisma, represents a significant upgrade in performance capability over the Magnetom TimTrio. To quantify the improvements offered by such a significant system upgrade, we scanned 8 subjects using a variety of anatomical, functional and diffusion protocols on the TimTrio platform, and then repeated the same protocols on the Prisma platform with the same subjects after the upgrade process. We found consistency in morphometric results from anatomical scans acquired using recommended T1-weighted imaging protocols. Modest improvements in tSNR for high-resolution and highly-slice accelerated BOLD scans were seen, but more traditional 3mm resolution scans yielded no improvement presumably due to the dominance of physiological noise. 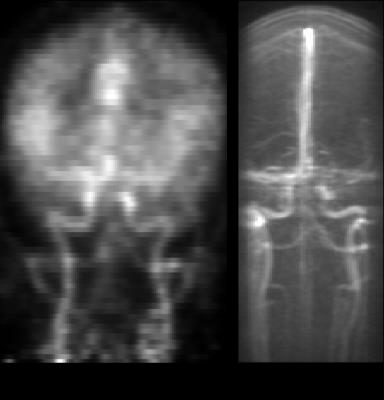 The DTI scans conducted here benefit greatly from the new gradient coil in the Prisma, when protocols are optimized to reduce TE and bandwidth as allowed by the new gradient set. Diffusion-prepared (dprep-TSE) TSE sequences are gaining attention for high-resolution distortion-free body DWI. However, dprep-TSE suffers from phase errors induced by both motion and eddy current effects. Motion compensation reduces motion effects, but eddy currents remain a source of phase errors. The present study investigates the performance of two alternative methods for compensating for eddy current effects in a motion-compensated dprep-TSE sequence: the use of phase cycling and the use of magnitude stabilizers. TSE is a rapid technique routinely used for T2 and FLAIR imaging. Three-Dimensional TSE with variable flip angles provides high scan efficiency, high SNR, and contiguous slice coverage. In this project we develop a 3D spiral TSE sequence employing a spiral-in/out readout for efficient acquisition but without the drawbacks associated with conventional spiral-out TSE. The variable flip angle schedule is adapted for long echo space to reduce waste in acquisition time. A concomitant phase compensation technique is incorporated to minimize the violation of the CPMG condition. Preliminary results demonstrate the feasibility of the proposed technique. Here we present a method capable of suppressing motion-related EEG GA instabilities, induced EEG voltages and fMRI artefacts in simultaneous EEG-fMRI data. This correction method appeared to allow for the removal of harmonics associated with incomplete GA removal even in a moving subject. Therefore our findings might be helpful in improving both EEG quantification reliability and data quality in populations prone to movement e.g. children or for studying patients with epilepsy during seizures. Previously proposed techniques based on non-Cartesian or modified Cartesian sampling schemes allow for free-breathing acquisitions with solid motion-robustness. However, residual artifacts such as motion blurring often remain. Techniques including self-gating, motion-weighting, and extra-dimensional reconstruction have been proposed to further improve image quality. Here, an analysis of these techniques is provided by performing multiple reconstructions of several volunteer and patient datasets, which were then evaluated by radiologists. Prospective motion correction inherently does not provide uncorrected images. Thus, for image assessment usually motion corrected and uncorrected data from two different scans – therefore with different motion patterns – are qualitatively compared. In this study, prospectively corrected data from a highly trained cohort is retrospectively decorrected to enable a quantitative assessment with image-based and segmentation-based metrics. The results indicate that for the observed small-scale, involuntary subject motion quantitative rather than qualitative assessment is necessary to estimate the image degradation. Head movement is a major issue in dynamic brain PET imaging. The introduction of a simultaneous MR-PET scanner enabled new opportunities to use MR information for PET motion correction. Here we present a novel method based on routinely acquired MRI sequences. Multi-contrast MR images are co-registered to extract motion parameters. These motion parameters are then used to guide PET image reconstruction. 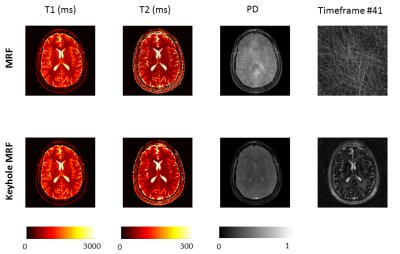 Results on both phantom and human data provide evidences that this method can significantly enhance image contrast and reduce motion artefact in brain PET images, without affecting MR protocol. The effect of head motion is a significant problem for MRI. Here we present the early stages in the development of a novel device which is able to measure head pose within the scanner. By using a combination of a commercially available 3-axis MEMS accelerometer and an anisotropic magnetoresitive bridge sensor, the orientation of the device is monitored with root-mean-square accuracy of ±0.12° while translation is estimated using voltages induced in a single coil by time-varying magnetic field gradients with an accuracy of ±0.45mm. With further development, this device could be used effectively for prospective and retrospective motion correction. In prostate MRI, tissue alignment between T2w and DWI can be challenging due to elastic distortions in DWI induced by fast switching of gradients. 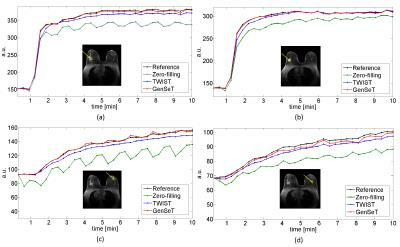 In this work, we propose a joint approach to perform registration between DWI and T2w on the prostate data, by considering both image intensity and prostate gland shape information. After rigid alignment between segmented prostate masks, surface points on the prostate masks were extracted and Gaussian mixture model was used to build shape correspondence. The shape information was integrated into mutual-information based deformable registration to constrain undesired distortions. The proposed framework was compared with other strategies and demonstrated the best registration accuracy (DICE = 0.91 between T2 and DWI based prostate masks). A remaining challenge of abdominal MRI are artifacts due to patient motion. 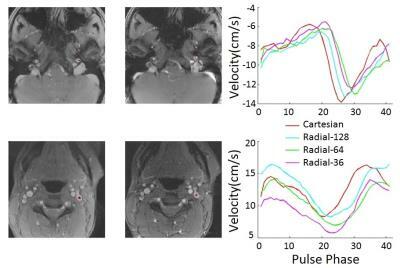 In this study, we evaluated a prototype volume-interpolated breath-hold examination (VIBE) sequence with automated respiration self-gating and compressed sensing reconstruction (VIBESG-CS) for continuous dynamic contrast-enhanced (DCE) liver MRI in comparison to a standard multiphase breath-hold examination (VIBEBH-STD). VIBESG-CS provided similar overall image quality and lesion conspicuity and improved image sharpness as compared to VIBEBH-STD. Therefore, VIBESG-CSseems to be a promising approach to improve the validity and reliability of DCE-MRI of the liver, especially in patients with impaired breath-hold capabilities. Magnetic field probes (FP) can be used to monitor B0-changes and this approach has shown great potential for real time correction of artifacts produced by such changes. When estimating B0fluctuations in the brain it is, however, not known how head motion influences the FP-based B0-estimation. Head motion introduces a B0-change both inside and outside the head, this study assesses the impact on field probe estimated B0-distributions within the brain at 7 Tesla. FP based correction after head motion can actually lead to a higher error especially evident when using third order spherical harmonics. 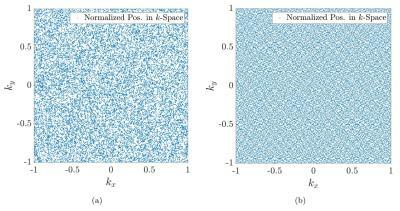 Improved performance is, however, identified when using first order spherical harmonics. Free-breathing 3D abdominal imaging is a challenging task for MRI since respiratory motion severely degrades image quality.Our purpose is to develop a novel reconstruction approach for highly accelerated free-breathing 3D abdominal images with stacked convolutional auto-encoders. The whole structure of our proposed method consists of 9 hidden layers except to input and output layer.The proposed method achieves similar quality to the whole sampling reconstruction with non-significant differences for structural similarity index measure (SSIM) (0.99 and 1.00, respectively). Moreover, the average reconstruction time is very short (about 0.25 s/image). Therefore, our method should be employed for a wide range of clinical applications. Subject motion is a major problem in brain imaging and spectroscopy, misleading diagnosis in the clinic and lowering data quality in research. A promising solution is to update the field-of-view in real time based on tracking with volumetric navigators. This was implemented using a new interleaved scanning framework and a product functionality for self-navigation of fMRI. The implementation is simple to use and very flexible, as the navigator and target sequence are simply defined as two different scans, that can be interleaved at any level. It was demonstrated to improve motion robustness in single voxel spectroscopy, T1-weighted imaging and angiography. Diffusion-prepared 3D TSE (dprep-3D-TSE) imaging has been recently applied for high-resolution distortion-free body and musculoskeletal DWI. Dprep-3D-TSE has been combined with magnitude stabilizers to reduce magnitude modulation effects induced by both motion and eddy current effects. In addition, velocity compensation has been proposed to reduce motion-induced phase modulation effects. However, given that dprep-3D-TSE is a multi-shot diffusion technique, it suffers from motion-induced phase variation effects across different shots and it requires phase navigation. The purpose of the present study is to develop an acquisition and phase correction scheme for one-dimensional phase navigation of dprep-3D-TSE imaging. The accuracy to compensate or correct for MR image artifacts from motion depends on the ability to precisely measure patient motion. Optical cameras are a compelling solution as they simplify patient setup and do not negatively impact MR data acquisition. However, most efforts have been focused on integrating and applying optical cameras to neuroimaging. In this work, setup and methods for video processing were developed for lung and abdominal MRI where MRI acquisition is especially sensitive to motion. The proposed solution had high correlation with conventional approaches of respiratory bellows and MRI navigators; also, comparable image quality was achieved. We propose a non-parametric method of jointly estimating non-rigid motion and the underlying image without the assumption of motion smoothness. We model non-rigid motion as local linear translation, which is equivalent to convolution with 1-sparse kernels. We then pose the non-rigid motion recovery problem as a sparse blind deconvolution problem. Our reconstruction results demonstrate that non-rigid motion can be well approximated as local translation motion using the proposed method. The proposed formulation can also be viewed as a generalization of locally low rank reconstruction. In this work, we experimentally explore the sensitivity of Magnetic Resonance Fingerprinting (MRF) to various types of motion at different time intervals during the scan. Our results show that the T1 values are least affected by motion, but the maps may be blurred if the motion occurs early in the scan. Also, motion in the middle of the scan leads to a systematic underestimation in T2. In addition, we show that simply removing the corrupted time-points from the data can restore quantitative parameter values to the correct range. Free breathing abdomen imaging requires non-rigid motion registration of the unavoidable respiratory motion in the 3D under-sampled datasets. In this work, pyramidal Lucas-Kanade based optical flow estimation is proposed to perform upper abdomen registration, which enables reconstruction of motion-free abdominal images throughout the respiratory cycle. Preliminary results on images acquired using 3D golden radial phase encoding eThrive scan demonstrate that our approach makes vessels in liver sharper and more consecutive when compared to traditional NMC and LREG based methods. 3D free-breathing approaches have shown potential for abdominal imaging in patients who are unable performing breath-holds, such as pediatric patients and uncooperative adults. However, these free-breathing techniques fail when bulk motion occurs. This study proposes a method to detect and exclude such bulk motion to ensure diagnostic image quality, even in this challenging group of patients. Without requiring user interaction, this technique improves robustness for abdominal MR imaging, while minimizing the scan time on an individual basis, using a real-time implementation on the MRI system, which may enable robust non-sedated pediatric imaging. Quantitative water content mapping is a promising technique to monitor brain diseases. However, established protocols suffer from long acquisition times and sensitivity to patient motion. To overcome these issues, we propose to use golden angle radial MRI and model-based iterative reconstruction. 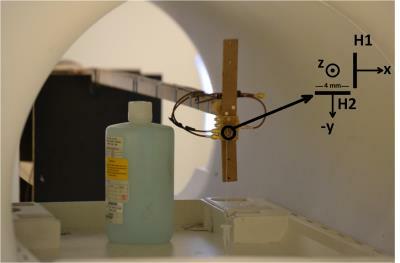 This allows accurate and precise estimation of water content and T1 values, while providing significantly higher motion robustness, as shown in phantom and in vivo experiments. The golden angle-based k-space sampling allows for a nearly optimal k-space coverage even in the event of early termination of measurement. This opens the opportunity to apply such a technique in the clinic. 90 A head motion model for fusion of patient pose measurements from different sensing modalities. In this work we aim to address the challenges of fusing motion parameters measured using different sensing modalities, as temporal resolutions differ widely between navigator and external motion tracking techniques. A model is presented in which head motion is characterised as simple rolling motion. The resulting equations describe subject motion to within 2 mm when applied in an open loop manner. A filter, with feedback, is then implemented where navigator data is used to estimate model parameters. The filtered translation output is smooth without the cost of increased latency due to the fast orientation estimates. Low-resolution, whole-head volumes can be acquired rapidly with EPI-based volumetric navigators (vNavs). vNavs interspersed in a longer scan are widely used for prospective motion correction in a variety of sequences. To further improve the accuracy and flexibility of vNavs, we present a novel registration algorithm, tailored specifically for the vNavs application. Accuracy of the algorithm is tested on navigator volumes acquired with human volunteers at three isotropic resolutions, 6.4mm, 8mm, and 10mm, using a series of field of view (FOV) rotations and translations to provide ground truth rigid “motion”. Preclinical quantitative MRI is susceptible to the motion artifacts caused by the rapid respiratory motion and high heart rates present in small animals. This can be alleviated through the use of gating/triggering but these are difficult to implement in magnetic resonance fingerprinting due to the need for dynamic, coherent signal evolutions. 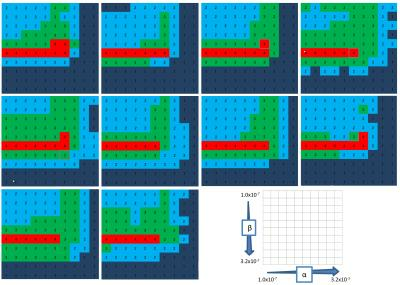 We propose a method for an incremented phase encoding MRF acquisition that enhances motion suppression in Cartesian MRF. This phase incremented strategy distributes motion artifacts throughout the acquisition creating incoherent artifacts allowing the MRF method to “see through” the artifacts and produce artifact free T1 and T2 maps. A reliable free-breathing (FB) cine DENSE method would benefit myocardial strain imaging in many patients. An echo due to T1 relaxation is an important source of artifacts, particularly for free-breathing acquisitions. We propose to optimize suppression of these echoes by minimizing k-space entropy. The method was tested in 10 subjects (6 healthy volunteers and 4 heart failure patients) and compared to a conventional diaphragm navigator method (dNAV). Image reconstruction by minimizing k-space entropy provided better image quality than the conventional dNAV method. 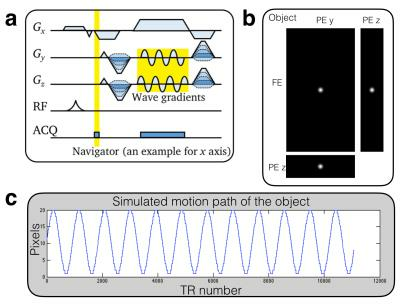 The motion-robustness of a 3D wave-encoded SPGR sequence was evaluated by simulating the acquisition of a Gaussian-profile object with periodic motion. Compared with non-wave-encoded sampling, wave-encoding provides better motion property because of wider diffusion of motion artifacts. A motion-correction method was also proposed for wave-encoding based on 3D translational motion estimates. This motion-correction method is demonstrated to effectively reduce motion artifacts in wave-encoded scans. Global B0 shifts caused by subject motion and scanner heating, result in phase inconsistencies, which lead to image artefacts. 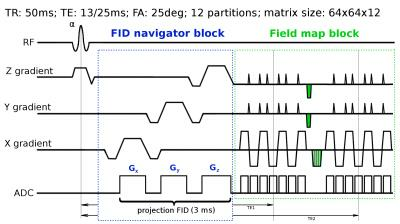 In this work, an FID readout is added to Spherical Navigator Echoes (FID-SNAVs) in order to perform retrospective motion and frequency shift (Δf) correction. The accuracy of FID-SNAVs in measuring Δf is evaluated, and simultaneous Δf and motion measurement is demonstrated in phantom experiments. FID-SNAVs estimate Δf accurately, and shifts of approximately -10 to 6Hz are measured during translations of ±1.5cm. Combined Δf and motion correction demonstrates dramatic improvement of image quality compared to motion correction alone. Motion quantification is essential for successful MR imaging and MRI guided radiotherapy of mobile organs. Currently, 3D MRI is too slow to quantify organ displacements and a motion model could alternatively be used for tracking and/or motion compensation. 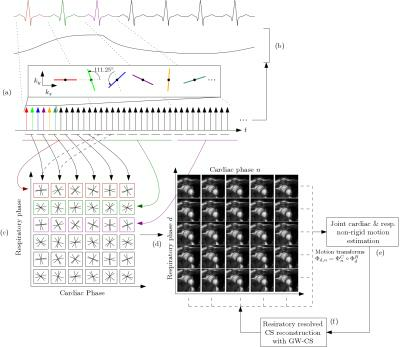 A motion model trained on MRI data and driven by the noise covariance matrix (NCM) of a receive array is proposed to quantify internal anatomy motion. Passive thermal noise measurements have a high temporal resolution (~10ms) and do not interfere with or rely on MR signal. Abdominal organ displacement can be accurately estimated in 3D, through the NCM of the receive array. An ellipse fitting approach has been recently proposed for simultaneous estimation of the relaxation times T1 and T2 from phase-cycled balanced steady-state free precession (PC-bSSFP). In this work we present an analysis of the SNR sensitivity of the proposed method and optimization of the sequence parameter settings. We demonstrate, that it is feasible to perform an accurate and precise T1 and T2 mapping while using an optimal FA and TR combination for realistic SNRs. The fat quantification using the bipolar multi-echo signals has several benefits such as fast imaging time, SNR, resolution, and robust separation. However, the fat quantification using the bipolar multi-echo signals suffers from the bipolar artifacts due to the imperfect gradient. In this abstract, to overcome these problems, fat quantification is independently performed for each polarity of the readout gradient. 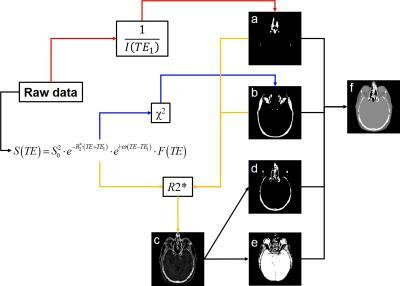 Because the acquisition of fully sampled data takes too much time, a new interpolation method for interleaved bipolar multi-gradient-echo acquisition is proposed, which uses the low-rankness of entire data. The experiment results show that the proposed method successfully quantifies the correct fat fraction without bipolar artifacts in a short imaging time. 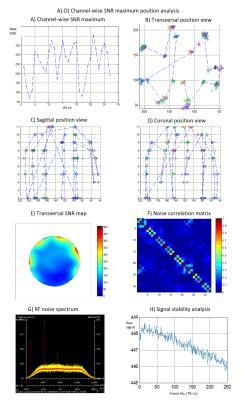 Direct Signal Control can be used for improving signal uniformity for TSE based 3D-FLAIR imaging at 7T by using dynamic RF shimming through the echo train. The need to calibrate and optimize on a subject-specific basis can be a workflow issue. In this work we evaluate generic solutions that are calculated in advance, in comparison with individual subject-specific optimizations. Multiple locations inside the volume of interest can be mapped to same frequency by applying spatially oscilating magnetic fields (SOMFs) created by 9 channel z-gradient array. Such a mapping can lead to excitation of multiple slices or slabs with a single band RF pulse as well as doubling the number of slices excited by a multi-band RF pulse. Depending on the slice or slab locations, spatially oscillating magnetic fields can be shifted using a independent gradient amplifiers. 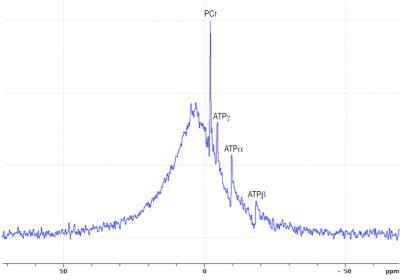 We have demonstrated 2 slab excitation with a single band RF pulse and 6 slice excitation with a 3-band RF pulse. Multi-slab time of flight MR angiogram (TOF MRA) provides more detailed vascular structure than single-slab MRA, whereas single-slab susceptibility weighed imaging (SWI) provides better SNR than multi-slab SWI. In previous CODEA study, conflicting requirement on number of slab was not solved. In this study, we proposed and demonstrated an efficient method to acquire TOF MRA and SWI simultaneously with different number of slabs using variable-slab CODEA, which suppressed slab boundary artifacts in TOF MRA. Also demonstrated was acceleration of the variable-slab CODEA with a parallel imaging technique, GRAPPA. These improvements would provide more diverse clinical information in a limited scan time. Root-flipped multiband pulses have peculiar spin-echo behaviour due to their non-linear phase profile. In spin-echo sequences, different slices will typically have different relaxation weightings. 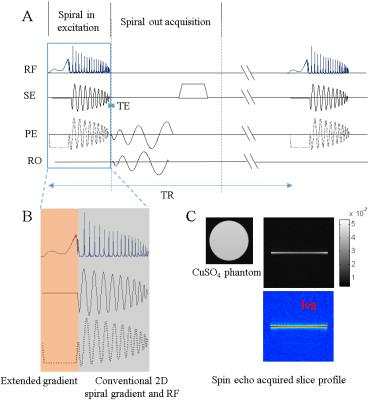 This work investigates the typical time-delays of the spin-echoes such pulses, and proposes a novel root-flipping method to minimize differences in relaxation weighting. Magnetic Resonance Fingerprinting (MRF) is an MR technique that generates parameter maps by matching pseudo randomly generated MR signals with a precalculated dictionary. In order to acquire the signals in a reasonable time, rapid imaging techniques with high undersampling factors are necessary. We show a detailed analysis of the artifacts originating from this and their impact on measured signals and subsequently on parameter maps. Additionally, an analytical approach of predicting undersampling artifacts is proposed. With the help of this approach, a more robust and time efficient sampling of signals in MRF can be designed. T2 mapping is a parametric imaging approach that provides quantification of T2-weighted images for a more accurate diagnosis of pathology. 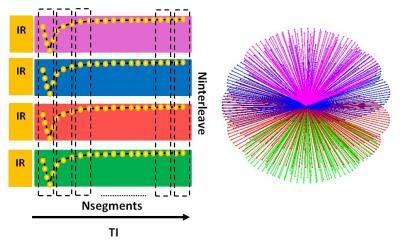 2D multi-slice T2 estimation techniques cannot be used for thin slice isotropic imaging. To overcome this limitation, we present a T2 mapping technique using a 3D radial FSE pulse sequence with a variable flip angle scheme for optimal T2-weighting and T2 mapping within SAR constraints. Data is acquired in a stack-of-stars radial trajectory and T2 maps are reconstructed using model based iterative algorithms. The method is demonstrated in phantoms and in vivo brain and musculoskeletal imaging. 23Na-MRI can be used for non-invasive investigation of metabolic disease, based on discrimination between sodium signals arising from different tissue compartments due to development of multiple quantum coherences mainly in intracellular space. Strongly modulated pulses in NMR and MRI can be created using optimal control design to generate the most efficient transfer between the initial and target states of the nuclear spin ensemble, defined by the density matrix formalism. 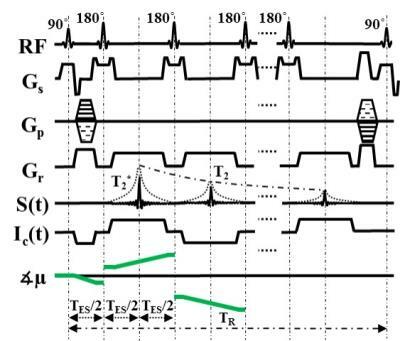 The Krotov algorithm and its implementation by Maximov of the optimal control design were used to modify the first hard RF pulse in the SISTINA sequence. 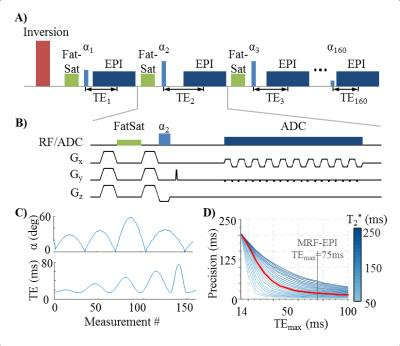 We report an imaging approach, Fast Interrupted Steady-State (FISS), for retaining the high signal associated with true fast imaging with steady-state free precession (TrueFISP), while lessening its sensitivity flow artifacts. 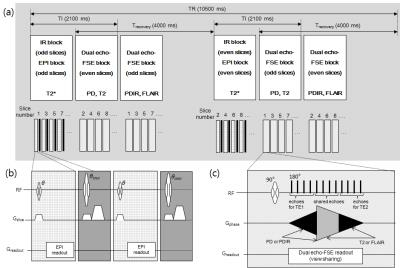 We propose a modified Magnetic Resonance Fingerprinting pulse sequence with quadratic RF excitation phase (qRF-MRF) for the purpose of simultaneous measurement of T2* in addition to previously established spin parameters δf, T1, and T2. 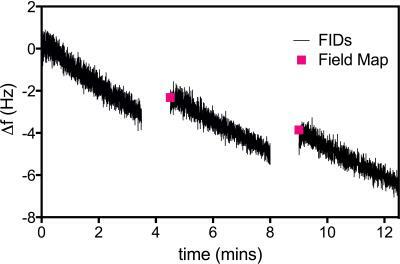 Existing bSSFP based MRF pulse sequence1 was modified to incorporate excitation segments with quadratic RF phase to sensitize signal evolutions to T2*. Measurements using qRF-MRF were performed in both phantom and in vivo. Maps from qRF-MRF were validated against traditional MRF, literature, and Multi-Echo GRE. Dual flip angle (DFA) methods facilitate T1-corrected proton density fat-fraction (PDFF) quantification at the cost of doubling scan time compared to small flip angle (SFA) methods. In this study, a novel “dual-TR” (DTR) fat quantification strategy was proposed. 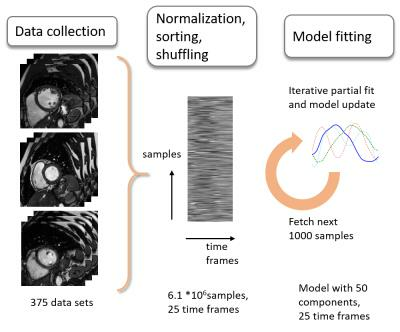 It acquired 2 spoiled gradient echo (SGRE) dataset sequentially, one with a shortened echo train and reduced TR to alleviate scan time penalties. Monte-Carlo simulation and Cramer-Rao lower bound demonstrated improved noise performance using the proposed method compared with SFA and DFA methods. Phantom experiments demonstrated the feasibility of T1-corrected PDFF estimates using the proposed DTR method. MR-STAT is a framework for obtaining quantitative parameter maps from a single short scan. It is based on a time domain model. Large numerical inversion problems are solved to simultaneously localize signal and estimate tissue parameters. In this work we demonstrate the first experimental in-vivo results obtained with a clinical MR system. xSPEN is a new single-shot imaging approach with exceptional resilience to field heterogeneities: its images do not suffer from miss-registrations, require a priori information nor use post-acquisition corrections, to deliver faithfully the spins’ spatial distribution. xSPEN, however, suffers from SNR penalties due to its non-Fourier nature and its considerable diffusion losses –especially when desiring high resolution. This study introduces partial Fourier transform approaches that acting along either the readout or the spatiotemporally-encoded dimensions, reduce both of these penalties. 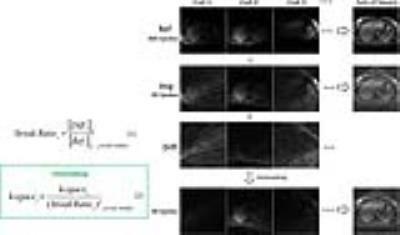 The principles of these partial FT methods are given, and applications in materials, preclinical and human single-shot xSPEN imaging are presented. This study proposes a rapid and accurate MR fingerprinting (MRF) framework based on inversion-recovery turbo spin echo (IR-TSE) sequence. 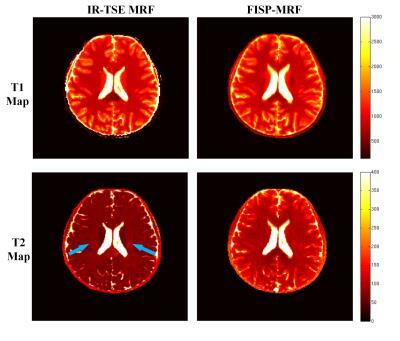 Compared with the conventional quantitative imaging method and FISP-MRF, the proposed one can provide T2 maps with high accuracy in addition to T1 and proton density (PD) for whole brain in about 6 minutes. 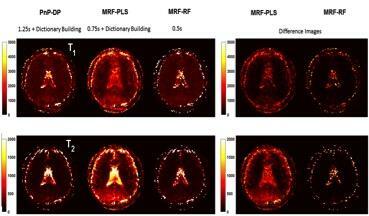 In this regard, this new MRF strategy would potentially aid in achieving high resolution quantitative mapping for T2-sensitive circumstances such as epilepsy and multiple sclerosis applications. 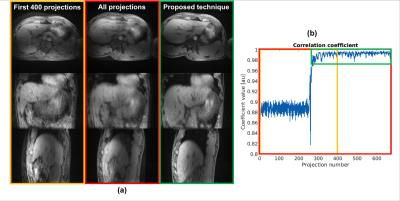 Two-point Dixon methods enable robust fat suppression particularly in body and abdominal applications where large field of view imaging is required. However, a limitation of this approach is the decreased efficiency and longer TR’s necessary to acquire multiple echoes. Furthermore, due to system performance constraints, flexible choice of image parameters necessary to obtain near in and out-of-phase echo times limits valid combinations of field of view, matrix size, and encoding bandwidth. In this study, we describe a novel, generalized framework to optimize a ramp-sampled readout, which allows reduced scan time, flexible parameter selection, and improved quantitative fat and water separation. Single-Shot diffusion weighted echo planar imaging (EPI) is known for its strong distortions due to long imaging readouts. However, even for segmented acquisitions, high resolution diffusion weighted imaging suffers from image distortions. Our approach shows that intrinsic field information of a segmented DTI acquisition can be used for robust distortion correction without blurring effects. In addition this approach offers the advantage to reduce artifacts from partial Fourier (PF) acquisitions due to better data distribution in k-space. In combination with the MUSE approach, this promising technique is applied to whole brain DTI with a resolution of 1mm isotropic. A motion-robust 2D sequential chemical shift-encoded MRI (CSE-MRI) technique with a short temporal footprint for each slice is investigated for ferumoxytol-enhanced MRI of placental inflammation. In this study, the proposed 2D technique was compared with the reference 3D-CSE-MRI technique in healthy pregnant rhesus, which were anesthetized eliminating fetal motion. B0 field map boundary measurements, as well as R2* measurements in the placenta were compared across the two techniques to assess the accuracy of the 2D technique. 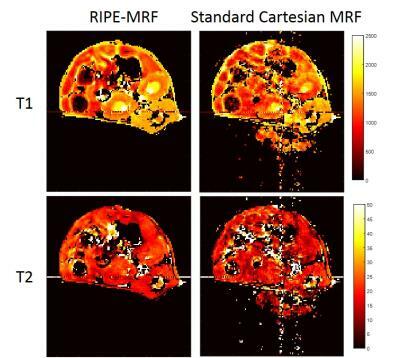 High correlations between the measurements from 2D-CSE-MRI and 3D-CSE-MRI were demonstrated and thus provide promise for motion-robust imaging of human placental inflammation. Free-breathing steady-state free precession MRI has shown promising results for pulmonary embolism diagnosis in preliminary studies. However, the acquisition is susceptible to artifacts from cardiorespiratory motion and flow. We propose a Golden Angle radial trajectory and show increased robustness to such artifacts in healthy volunteers, while providing added benefits such as sliding window reconstructions with higher temporal resolution than what is achievable by Cartesian sampling. 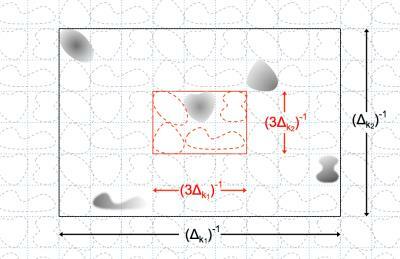 By natural or artificial arrangement, excited spins may cluster in discrete areas of a multi-dimensional image-space. By leveraging gaps in-between, one may under-sample k-space while preserving the ability to map the spin distribution. FOV-packing is a new technology that maximizes efficiency mapping gapped distribution (spatially, spectrally and etc.) and extends reach. 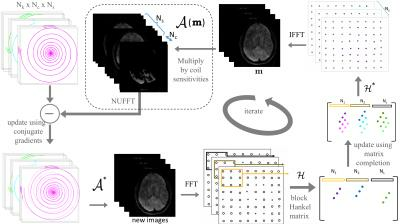 When applied to simultaneous multi-slice MRI, it leads to a unique technique that is speedy (due to sampling of image space and acceleration of encoding), with √N SNR scaling (due to volumetric encoding’s noise averaging effect) and super-resolution capability (due to FOV packing and the option of resolving sub-slices). The balanced steady-state free precession acquisition approach is well-suited to quantitative magnetization transfer studies, owing to intrinsic MT weighting, rapid acquisition times and good SNR. However, the presence of off-resonance banding artefacts have limited its use, especially at B0>1.5T. This work is the first to evaluate a phase-cycled approach to bSSFP that can remove banding artefacts by taking maximum intensity projection MIP or taking a weighted mean as part of the qMT analysis. We conclude that neither MIP and weighted mean alone are capable of fully removing banding artefacts from qMT maps. Single-point imaging (SPI) methods are a rarely discussed topic due to the related long acquisition times. However, single-point imaging sequences provide a powerful tool for the suppression of susceptibility and chemical shift artefacts. Additionally, single-point imaging methods exhibit the intrinsic possibility of arbitrary sampling, which makes them predestinated for the combination with imaging acceleration methods, such as Compressed Sensing as a type of non-linear optimization. 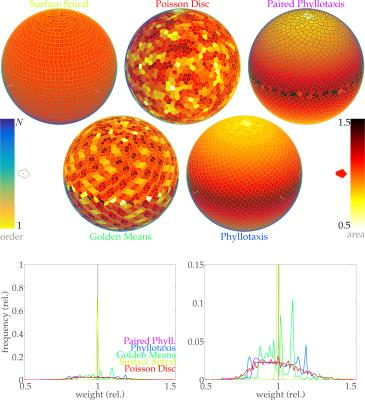 In this work, we present a three-dimensional spherical SPI quasi-random MRI trajectory, generated using low-discrepancy algorithms with density-optimized centre-oversampling, capable of high undersampling and metal-artefact suppression. The acceptance of 3D TSE sequences in spine imaging has been low up to now, mainly because of their long scan times. 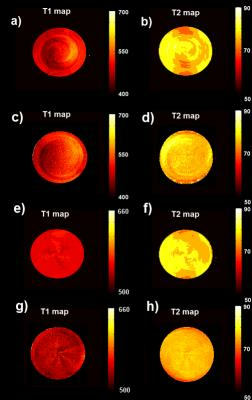 In this work, their acceleration by a combination of compressed sensing and parallel imaging was investigated. Moreover, their extension by an integration of chemical shift encoding was explored to obtain two contrasts simultaneously. For this purpose, a 3D dual-echo Dixon TSE sequence was implemented and evaluated in T2-weighted imaging of the lumbar spine. A B0 mapping of highly inhomogeneous fields is introduced. The method acquires refocused echo signals generated by a missing-pulse steady-state free precession (MP-SSFP) sequence with three-dimensional phase-encoding gradients. A B0 map is calculated from the refocusing and dephasing of spin phase around the echo centers. Validation was performed in a phantom experiment conducted with a permanently inhomogeneous field produced by mounting a head gradient coil at 36 cm out of the isocenter of a 90-cm 4T magnet. Using the measured B0 field map, we demonstrate correction of image distortion caused by the extremely nonlinear inhomogeneous B0 field. We propose cascaded CNN operating on k-space and image domain alternatively for reconstruction of undersampled MR images. Our cascaded CNN is capable of restoring most of detailed structures in the full-sampled image while sufficiently removing undersampling artifacts. One challenge for MR reconstruction is to heuristically select the appropriate regularizer for the optimization problem. This abstract proposes a novel deep learning based reconstruction approach for accelerated MR imaging. With the training using clinical MR images and their retrospectively undersampled noisy images, this algorithm learns the specific parameters of a general regularizer for the optimization problem, and uses this regularizer in the iterative reconstruction to achieves high image quality with high acceleration factors. The sparse-representation-based super resolution is an efficient learning-based method. This method involves two key steps. One is to learn two dictionaries for low/high-resolution image patches, and the other is to learn a mapping between low resolution example patches and their corresponding high resolution patches from massive external images. We presented a super resolution method for MRI from reduced k-space acquisition sequences via deep convolutional neural networks. The proposed method directly learns an end-to-end mapping between the low/high-resolution images.Our proposed method is tested on the OpenfMRI database. It significantly outperforms the zero-filled reconstruction and an existing learning-based MRI SR method. 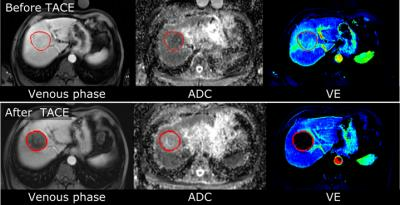 We investigated the novel problem of predicting treatment decision for cancer patients using imaging feature analysis. We implemented deep learning feature classification framework consisting of feature computation with deep convolutional neural network (CNN) model and k-nearest neighbor (kNN) feature classification. The preliminary study on TCIA prostate cancer T2 MRI database showed the promising results and the potential of future researches. In this study we compare the performance of Support Vector Machine (SVM)-based and Deep Neural Network (DNN)-based active learning for automated assessment of MR image quality. MR images were labeled by radiologists concerning perceived image quality and used as training and test data. DNN and SVM were trained to classify image quality on the training data. An active learning scheme was used for optimization of the training procedure. We found that using acitve learning with either SVM- or DNN- based classification allows for accurate and efficient automated assessment of MR image quality. Deep learning based fast MR imaging (DeepLearnMRI) has been an appealing new research direction, which utilizes networks to draw valuable prior information from enormous existing high-quality MR images and then assists accurate MR image reconstruction from undersampled data. This paper explores optimal undersampling trajectory for DeepLearnMRI. Specifically, we designed hamming filtered asymmetrical 1D partial Fourier sampling scheme for fast MR imaging with our developed super-resolution convolutional neural network. 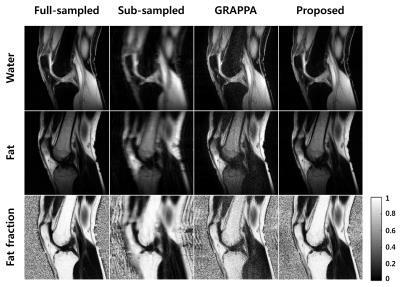 Experimental results on in vivo dataset show that the proposed scheme allows DeepLearnMRI to reconstruct more accurate MR images with less time compared to the Classical GRAPPA and SPIRiT. Fat/Water classification methods relying on image intensity histograms or hydrogen chemical-shift spectra can be subject to failure when assumptions in the algorithm are not met. In this study, we propose a new classification method based entirely on machine learning. Different neural network types were trained and tested on databases covering various anatomies, RF-coil types and image contrasts. A 2D paired classification using a fully connected neural network was capable of reliably classifying fat versus water with an accuracy of 100% on test data sets different from the training data, with a clinically relevant processing time of 0.05 s per case. Detection and classification of head motion may be required for optimal application of prospective motion correction techniques for brain imaging using external tracking systems. Supervised neural networks using various motion metrics were designed to classify head motion inside MR scanner into rigid-body motion and skin motion using single-marker 6-DOF information. The neural networks were trained using volunteer data and then applied to head motion data from 6 clinical in-patients. Neural networks could consistently achieve overall accuracy of 75% or greater. 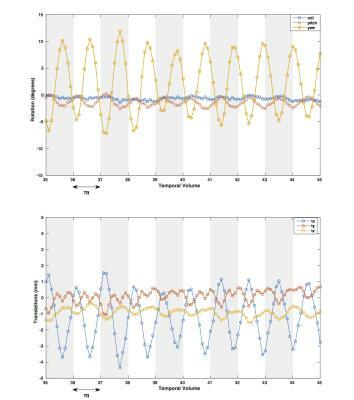 This study is the first attempt for a learning-based algorithm to be applied to banding artifact suppression in balanced steady-state free precession (bSSFP). We trained multilayer perceptron (MLP) models with two or four phase-cycling datasets and banding-free datasets as inputs and outputs, respectively. We demonstrated that MLP was superior to existing methods in terms of banding artifact suppression and SNR efficiency, which was clearer in two phase-cycling datasets. Furthermore, MLP was widely applicable to various image sets, irrespective of scan parameters, body organs, and field strengths. The learning-based approach is promising for banding artifact suppression of bSSFP. Arterial Spin Labeling (ASL) MRI is a powerful neuro imaging tool which provides quantitative perfusion maps. However, ASL perfusion maps typically suffer from low SNR and resolution. Averaging from multiple scans (high Nex value) can improve the SNR but at the cost of significantly increased acquisition time. 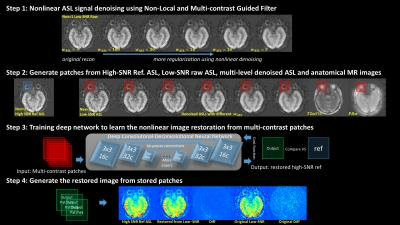 In the work we proposed a technique for improved ASL image quality with boosted SNR and/or resolution by 1) incorporating the information of multi-contrast images 2) using nonlinear, non-local, spatial variant multi-lateral filtering, 3) training a deep network model to adaptively tune the final denoising level and further boost the SNR and improve image quality. Various in-vivo experiments demonstrate the superior performance of the proposed method which will significantly accelerate ASL acquisition and improve image quality. 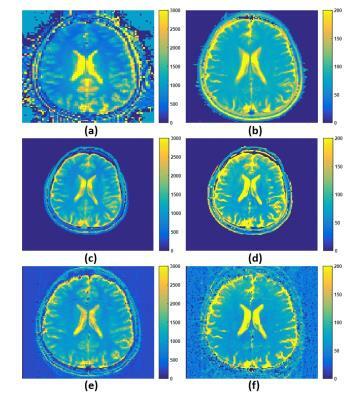 This paper develops a deep learning based multi-contrast MR imaging method. Unlike existing methods which mainly draw prior information from the target structure or a few reference images, we design a multi-contrast convolutional neural network to draw automatic feature descriptors for describing the multi-contrast correlations and identify the nonlinear mapping with the utilization of enormous existing multi-contrast MR images as training samples. Once the network is learned, it performs as a predicator for the online multi-contrast MR imaging. Experimental results on multi-contrast in vivo dataset show that the proposed method could restore lost information from the undersampled MR images while keeping their contrasts. Magnetic resonance imaging (MRI) of bones has added value for fracture risk assessment in osteoporosis, a disease of weak bones. However, manual segmentation of bone images is time-intensive, causing slow throughput for test results and inefficient risk assessment for patients. In this work, we implemented an automatic proximal femur segmentation algorithm by modeling a convolutional neural network (CNN) as a pixel-wise binary classification. 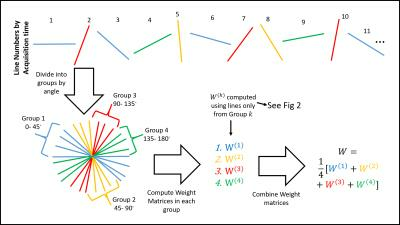 The accuracy of automatic segmentation was investigated by analyzing similarity between automatic and manual ground-truth segmentation. In addition, we compared the time required for manual fine-tuning of the CNN segmentation with original manual segmentation. Subtraction-based imaging methods like pseudocontinuous arterial spin labeling (pCASL) in the body are challenging due to physiological motion. Respiratory motion prediction (RMP) using an artificial neural network (ANN) and pencil beam navigators was previously integrated into a pCASL sequence to permit free-breathing perfusion MRI of the kidney. 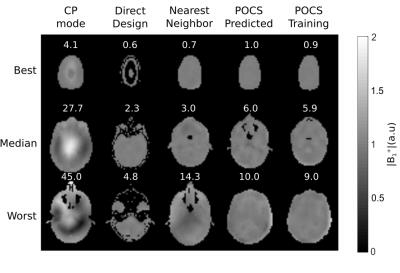 In an effort to improve the accuracy of the RMP, we compared the performance of a promising fuzzy deep learning (FDL) algorithm with ANN using navigator-echo displacements recorded from 8 volunteers during pCASL. FDL combines ANN with fuzzy logic. However, the ANN performance was significantly better than FDL for the pCASL application. Recently, several works have applied the deep learning technique to medical imaging problems such as lesion classification and image reconstruction. The deep learning techniques have advantages of learning from big data, however, in medical imaging, collecting an amount of training data is not easy because of expense, privacy, and so on. Strategies to supplement insufficient training data are important topics for applying deep learning to medical imaging field. 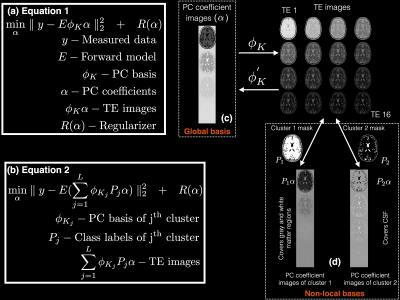 In this study, training data are generated from the simulated images and the acquired MR images, which are utilized to learn the architecture of multilayer perceptron to reduce imaging time. We implemented efficient and robust matching of signals acquired in magnetic resonance fingerprinting by use of neural networks and show its superiority in terms of speed and robustness to noise. Deep convolutional neural networks are increasingly being used to solve challenging medical image processing tasks. 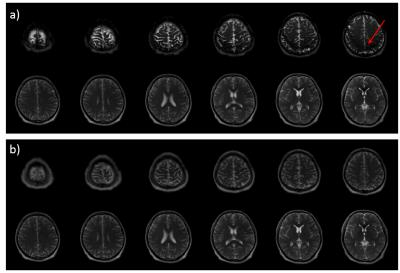 The acquisition of high resolution quantitative parameter maps in MRI, such as T1 and quantitative susceptibility maps often require long or additional acquisitions and post-processing steps. We therefore trained a convolutional neural network on a minimum deformation model of MP2RAGE data acquired at 7 T and show the feasibility of computing T1 maps from single subject data. An online learning algorithm is used to derive a generic model for dynamic cardiac MR data from a large set of training data. Image quality of reconstructed data could be improved and smoothing in time domain reduced. A method is presented for prediction of patient-tailored, SAR-efficient RF shims via machine learning. An iterative training scheme allows fast prediction of SAR-efficient shims for new head phantoms using little B1+ map data. 44 Machine-learning-based treatment response stratification for trans-arterial chemoembolization in HCC patients. In determining the effectiveness of chemoembolization in HCC, functional MRI has been shown to differentiate responders and non-responders earlier than anatomical measurements such as RECIST or EASL criteria. In previous studies, multiparametric response criteria based on thresholds of changes in ADC and venous enhancement (VE) intensities were proposed. We present improved stratification based on machine learning and image-based features. On a set of 57 chemoembolization patients, the proposed approach achieved a mean classification accuracy of 84% versus 66% for the previous threshold-based approach. These results further demonstrate the incremental value of functional MRI over traditional anatomical measures. The purpose of this study is to propose a fast T1 estimation method with improved accuracy over existing approaches in a Multiple Flip Angle setting. 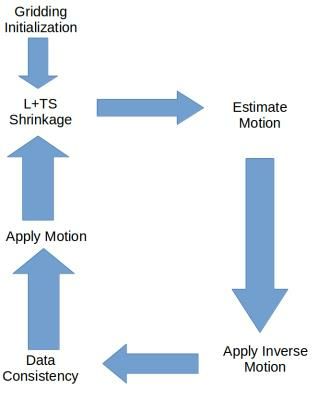 A supervised machine learning based approach has been proposed that can be used to predict additional Flip Angle data using limited available Flip Angle data, thereby producing more accurate T1 estimation in reduced scan time. Both experimental as well as simulation results are shown to illustrate the efficacy of this approach. The accuracy of T1 estimation depends on the choice of Flip Angle data to be predicted. Although machine learning applications for non-medical imaging are well-established, its use in radiologic imaging interpretation remains nascent. 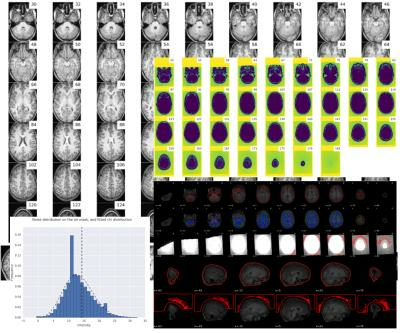 We trained a support vector machine using advanced MR imaging to differentiate glioblastoma and brain metastasis with 72.6% balanced accuracy. The ability for machine learning to aid radiologists in differentiating pathologies with similar appearance on conventional imaging appears promising. Multi-task classification targeting multi-center ASD diagnosis is not well investigated yet. 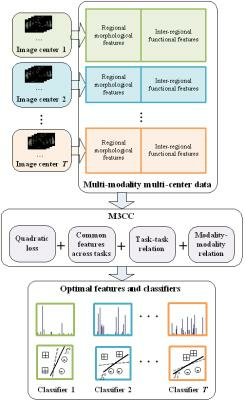 Taking advantages of the Autism Brain Imaging Data Exchange (ABIDE) database, we propose a novel multi-modality multi-center classification (M3CC) method for accurate ASD diagnosis. We formulate the diagnosis into a multi-task learning problem, as each task corresponds to the classification of the subjects of one center. Our comprehensive experiments show that, by incorporating multi-modality neuroimaging data and handling multiple centers jointly, the performance of computer-assisted ASD diagnosis is increased significantly. 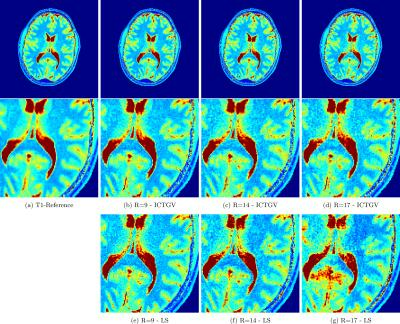 Magnetic Resonance Fingerprinting (MRF) provides for simultaneous generation of MR multi-parametric maps from a single acquisition. 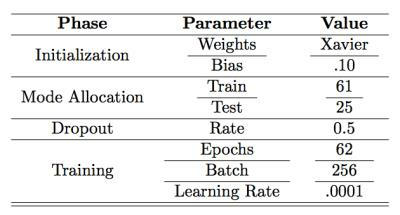 In this work, a machine learning based regression method that does not require a dictionary has been demonstrated. A leave-one-out evaluation strategy was employed for numerical evaluation of the proposed MRF-RF approach. A comparative study was performed on two previously employed matching methods. Results depict that proposed MRF-RF method produces maps similar to the vector dot product approach, with a 10-fold saving in time. The method can also be extended to other non-linear maps such as B0 inhomogeneity, diffusion maps, and perfusion maps. MRI is gaining popularity for identifying atherosclerosis, a common disease caused by the accumulation of cholesterol in arteries. To identify vulnerable plaque, the components in plaque need to be segmented by radiologist manually, which is both hard and tedious. Previous attempts to solve the problem using probability maps are limited by their accuracy. 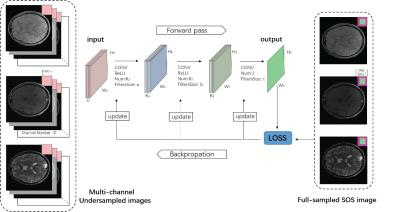 We leverage the recently developed convolutional neural networks (CNN) to build a model based on 1,000 subjects automatically, achieving significantly better accuracy in almost every metric over traditional methods. 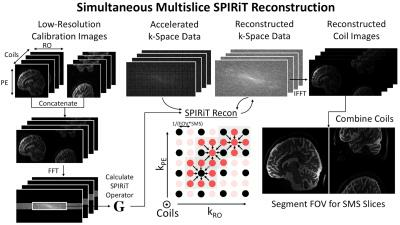 Multishot variable density spiral is an efficient sequence for diffusion imaging with the oversampled k-space center serving as a navigator. However, the shot-to-shot phase variation of multishot acquisition due to motion must be corrected. To improve the reconstruction accuracy, we propose a novel reconstruction framework using SPIRiT-based reconstruction, integrating the information of phase variation and coil sensitivity in order to correct for the ghosting artifacts of multi-shot DWI. Both simulation and in-vivo experiment validated the superior performance of the proposed method to reconstruct more accurate images than CG-SENSE for VDS DWI. In this abstract, we developed and evaluated an improved stack-of-stars (SOS) sampling strategy that can efficiently sample 3D k-space and reduce streaking artifacts. Compared with conventional SOS sampling strategies that collect the same radial angle for every slice, proposed method rotates the spokes in a golden-angle manner along the slice direction, which modifies the aliasing pattern resulted from k-space under-sampling. With either gridding reconstruction or more advanced methods, proposed rotated SOS sampling strategy provides improved image quality with reduced streaking artifacts and better delineation of fine structures. a-f SPARSE is a new technique which enables the k-t SPARSE approach to be used for radial trajectories in the Radon domain. 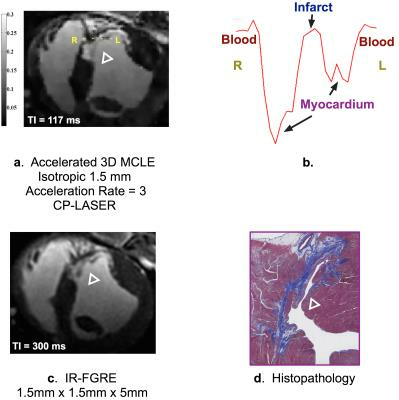 Its use for cardiac imaging retrospectively accelerated by a factor of 4 is presented. Streaking artifact is one of the major causes of image quality degradation in radial MRI. Since multicoil arrays are widely used in modern MR scanners, an easy way to reduce streaking artifacts is to identify coil elements that are contaminated by a high level of streaks, and then exclude them from image reconstruction. 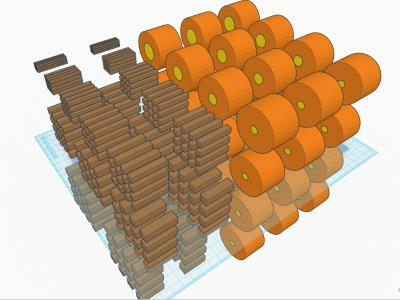 However, such an approach requires accurate clustering algorithms to automatically select unwanted coil elements. In this work, a method called “Unstreaking” is proposed for automatic streaking artifact reduction without the need to exclude coil elements. The method was tested for accelerated radial DCE-MRI of the liver. Iterative reconstructions of undersampled non-Cartesian data are computationally expensive because non-Cartesian Fourier transforms are much less efficient than Cartesian Fast Fourier Transforms. Here, we introduce an algorithm that does not require non-uniform Fourier transforms during optimization iterations, resulting in large reductions in computation times with no impairment of image quality. 3D-FFT via gridding is generally recognized as computationally faster than direct 3D filtered backprojection (FBP) in 3D radial-data reconstruction. To overcome the computational time issue of 3D-FBP, we investigated two-step 2D-FBP reconstruction having an alternative k-space trajectory. Computational requirements were theoretically analyzed to permit clear comparison among three reconstruction methods and computational burdens based on mathematical expressions were compared to actual computation times. In conclusion, two-step FBP provides considerable computational speed benefit over direct 3D-FBP and, under certain realistic conditions (e.g., with many channels), even over 3D-FFT, while showing almost same image quality in phantom and brain imaging. Most previous approaches to spiral water-fat imaging perform the water-fat separation and deblurring sequentially based on the assumption that the phase accumulation and blurring are separable. A joint water-fat separation and deblurring method has been recently proposed using more accurate signal models. In this study, the sequential and joint methods are quantitatively compared. Simulation and experiments have demonstrated that the results of the joint method are significantly better in regions where the field inhomogeneity changes rapidly in space. The loss of signal-to-noise-ratio is minor for both approaches at optimal TEs when the noise in the field map Δf0 is negligible. Stack-of stars k-space trajectories following the golden angle scheme allow retrospective binning and reconstruction of data acquired from free-breathing patients, which is of particular interest in abdominal applications. Here we demonstrate that using an iterative non-Cartesian reconstruction in combination with an elastic registration algorithm produces images with high image quality for all motion states, regardless of the degree of under-sampling in the reference motion state. Rapid 3D acquisition with long spiral readouts is enabled by multiplanar undersampling, array detection and an expanded signal model including off-resonance. Whole brain coverage with 1.5 mm isotropic resolution is achieved in 3.1 s.
Radial cardiac real-time datasets are usually compromised by streaking artifacts. Truncated principal component analysis (PCA) has been proposed to remove streaking and improve apparent SNR of the images. However, a proper threshold for truncation of the PCA has to be selected to maintain good temporal fidelity. This work proposes a method for automatic truncation of the PCA and compares a soft against the standard hard thresholding approach. Results indicate that the proposed method in combination with soft thresholding offers reduced temporal blurring and streaking artifacts while improving apparent SNR. Ultrashort echo time (UTE) sequences are usually applied for imaging of very short T2* tissues, for the evaluation of water content in the cortical bone and for X-nuclei imaging. The aim of this study was the implementation of an automatic calibration measurement to determine the actual k-space trajectory considering noisy data samples in UTE imaging. In contrast to most other studies, not only gradient delays were taken into account, but also gradient waveform distortions. 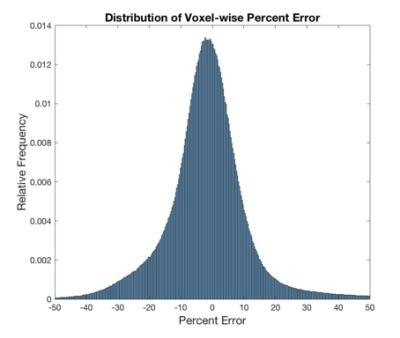 It could be demonstrated that there exist an optimal number of samples used for correction (depending on signal-to-noise ratio) that should be determined by calibration scans. Gridding is a relevant algorithm for both image reconstruction and pulse design. With Gridding, it is crucial to appropriately compensate for varying density of the sampling trajectory. In this paper, we present a technique to determine the weights by solving a least squares optimization problem. 61 Reducing the effects of under-sampling in images acquired with a 3D radial sequence for the purposes of real-time navigation. Radial sequences hold great potential for real-time navigation in MRI. Navigator images can be produced off very few spokes of sampled data however, characteristic streaking artifacts appear due to under-sampling at the outer edges of the k-space field of view. In this study, a method is proposed to reconstruct navigator images with a reduced base resolution to minimize the effects of under sampling and reduce the appearance of streaking artifacts, improving the accuracy of motion-registration. The success of this method supports the pursuit of radial sequences for applications in real-time navigation. Ultrashort echo time (UTE) imaging with cone trajectories was installed to a 1.5T compact MRI system using an unshielded insertable gradient coil. K-trajectories of the 3D cone trajectory acquisition were measured using a small capillary phantom and used for image reconstruction. A LEGO block sample with T2* of about 0.6 ms was successfully imaged with echo time of 0.05 ms to 0.6 ms. This result demonstrated that UTE imaging sequences with cone trajectories were successfully installed to our system. Golden angle radial acquisitions are sensitive to gradient imperfections leading to reduced image quality. Multiple methods are known to compensate for the zeroth and first order gradient waveform imperfections. Here we quantify the effect of these different methods on Philips 1.5T and 3T wide bore Ingenia scanners, and assess four direct correction methods on efficacy. We show that on these systems a gradient delay correction has minimal impact on the image quality, while phase correction provides a considerable improvement. Rapid image acquisition is required to assess myocardial first-pass perfusion. K-t CS which uses compressed sensing has produced dynamic images with sufficient resolution. View sharing methods such as k-t VS could potentially provide similar results eliminating the need for regularization weights and significantly decreasing reconstruction time. 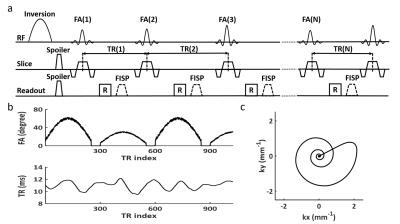 K-t CS and k-t VS were investigated to determine their temporal and spatial response during first-pass myocardial perfusion. Results demonstrate that images reconstructed using each method had similar resolution and showed good correlation in assessing uptake kinetics. However, at higher acceleration, k-t CS showed increased SNR and smoother appearance while k-t VS used a less computationally intense and faster reconstruction. Echo-Planar-Imaging1 (EPI) with trapezoidal Readout (RO) and blipped Phase-Encoding (PE) gradients gives a high level of acoustic noise2. To reduce acoustic noise we suggest prolonging the duration of the blipped PE gradient in combination with a sinusoidal or trapezoidal RO gradient and continuous data sampling throughout the whole RO train. This results in a variable density sampling along PE (less dense at the edges, denser in the centre of k-space) with a non-Cartesian trajectory, where we use ESPIRiT3 to reconstruct the data. The efficiency is improved due to continuous data sampling, resulting also in a reduced echo time. The 3D Shells trajectory-based MRI acquisition is a non-Cartesian acquisition technique that divides the 3D k-space into a series of concentric shells and samples each one with 3D helical readouts. Using the Shells trajectory, the inner k-space can be efficiently sampled within several interleaves, making it a maximally centric 3D acquisition. Partial Fourier (PF) acquisition is a commonly-used acceleration technique by exploiting the conjugate symmetry of k-space measurement. In this work, we present a new asymmetric 3D Shells trajectory design with PF acceleration to combine the advantages from both techniques, and develop a non-iterative homodyne reconstruction framework for it. A design consideration for center-out k-space trajectories is the angular distribution of trajectory endpoints (or equivalently, exit angles). Uniformity is desirable, but the regularity of spacing affects aliasing patterns, which can dictate undersampling performance. Here, a method for choosing points on a sphere with Poisson disc spacing is described, and its use in selecting angles for a 3D radial UTE sequence is validated. 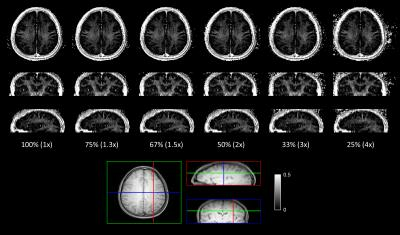 Spiral real-time MRI (RT-MRI) is a valuable tool in speech production research. A key drawback is off-resonance blurring artifact that appears at the boundaries of important articulators. 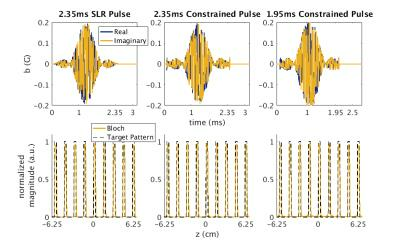 In this work, we demonstrate dynamic off-resonance estimation that is directly captured from phase of single echo-time dynamic images after coil phase compensation. Multi-frequency reconstruction then provides deblurring and improved depiction of articulator boundaries including the tongue, hard palate, and soft palate. The scan technique and reconstruction method presented in this work are designed to reduce the scan duration of 2D time-of-flight angiography sequences. The acquisition makes use of a sliding-slice technique that eliminates the need for steady-state prep pulses, which are needed before each slice in time-of-flight. This reduces the total scan time of a 2D spiral time-of-flight sequence by almost half, without a reduction in k-space coverage. High-resolution MPRAGE has become a standard structural imaging sequence in clinical settings yet it is difficult to repeat the scan because of its relatively long acquisition time. Acceleration techniques allow the reduction of acquisition times although excessive acceleration can result in artifacts. We implemented a fast MPRAGE sequence using a spiral trajectory and demonstrated segmentation of acquired images. The spiral MPRAGE can acquire a whole-brain T1 volume in less than 25% of the acquisition time of the conventional MPRAGE while maintaining comparable contrast and segmentation results. Turbo spin-echo (TSE) is a rapid technique routinely used for T2 and FLAIR imaging. Two-dimensional spiral TSE is very challenging due to T2 signal decay. 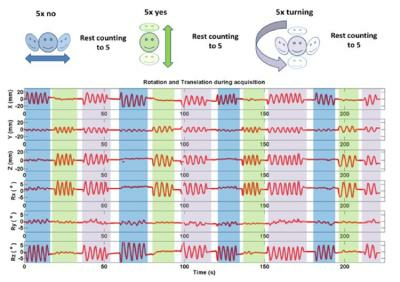 In this project we develop a 2D spiral TSE sequence employing a spiral-in/out readout for efficient acquisition without off-resonance phase errors, and a double encoding mechanism as well as signal demodulation to minimize T2 signal decay induced artifacts. A concomitant phase compensation technique is incorporated to mitigate the violation of the CPMG condition. Preliminary spiral TSE FLAIR results demonstrate comparable image quality to its Cartesian counterpart. MR Fingerprinting can be used for a fast and quantitative estimation of physical parameters in MRI. For the fast acquisition of MRF, common approaches have used non-Cartesian sampling of k-space. Here, we introduce a method for non-iterative anti-aliasing of the spiral MRF time series, based on the concept of keyhole imaging. Our approach does not change acquisition or dictionary creation and matching procedures. As frames require only minimal density compensation in k-space, noise amplification during reconstruction is reduced. After applying our algorithm, individual images from the MRF time series are artifact-free and clearer parameter maps are obtained in a shorter time while preserving the accurate quantification of MRF. A 2D zero TE imaging technique was implemented with a gradient-extended 2D spiral-in excitation to excite a slice within 3mm full-width-half-maximum (FWHM) with pulse duration less than 6ms and spiral-out acquisition (GRESS-ZTE) strategy. Our preliminary data showed its ability to acquire signals in bones with very short T2*. In dual-echo subtraction ZTE (DE-ZTE) MRI, it is crucial to correct for gradient delays in the second echo for high image quality. Linear phase fitting on the relative phase difference between projection pairs in image domain can be performed to estimate TE shifts, but it is not highly robust. Field camera can be used to externally provide TE shifts arising from gradient delays, but the probes tend to dephase at high resolution DE-ZTE scans. 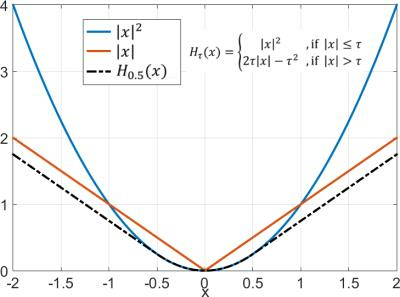 We demonstrate that gradient delays can be characterized as a linear function of gradient strength. Furthermore, we show that this can be exploited to reconstruct high resolution DE-ZTE data at 7T for high image quality. Ultra-short-echo-time MRI may be used to generate imaging biomarkers to phenotype pulmonary abnormalities and facilitate the development of novel treatments but requires clinically-acceptable lung segmentation. We proposed an adaptive kernel K-means approach combining MRI signal intensity and neighbourhood location information for optimized lung segmentation. The resultant high dimensional features were implemented using a K-nearest neighbour graph and relaxed to a point-wise upper-bound formulation regularized by image edge information, which was implemented iteratively using a continuous max-flow optimization approach. Experimental results for 10 asthmatics demonstrated highly accurate, reproducible and computationally efficient lung segmentation for our approach consistent with clinical workflows. 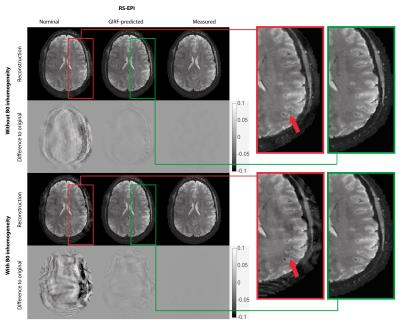 Proton density (PD) weighted Zero TE (ZTE) MR imaging has been demonstrated to provide accurate bone depiction, segmentation and pseudo CT conversion in the head. However, when applied for the whole-body, discriminating between air and bone appears challenging (primarily because of SNR and RF shading). Here we present a novel method for decomposition of low ZTE signal intensity regions into bone and air based on connected component and shape analysis. 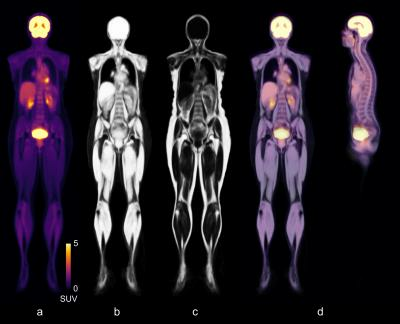 The method is demonstrated for whole-body, pseudo CT conversion in three PET/MR patients. MR imaging of short relaxation times spin systems has been a widely discussed topic with serious clinical applications and led to the emergence of fast imaging ultra-short echo-time sequences such as UTE and ZTE. 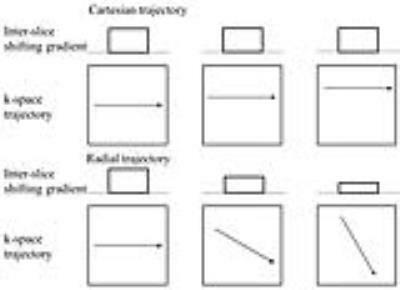 Nevertheless, these sequences suffer from image blurring due to the related point-spread function and are highly prone to imaging artefacts arising from e.g. chemical shifts or magnetic susceptibilities. In this work, we present a fully functional concept of spherical quasi-random single-point imaging that is highly acceleratable due to intrinsic undersampling properties and capable of strong metal artefact suppression with high tissue contrast. This study aimed to investigate the feasibility of ultrashort echo time (UTE) in visualizing the Eustachian tube (ET). Nineteen healthy volunteers were involved in this study. The quality of images was rated by two experienced radiologists using a double-blind method. Using the depiction of the cartilaginous part of the ET from standard T2-weighted images and that of the bony part from CT acquisition as reference points, UTE images were analyzed. The results indicate that UTE can not only display ET cartilage, but also display bone structure. This could lead to the application of whole-ET imaging in one MR exam. A new method for long-T2 suppression in a prepared steady-state 3D-UTE sequence is introduced. The method is based on long-T2 signal behavior in steady-state as the diffusion-inducing spoiling gradients are modified, giving a theoretical signal cancellation using appropriate coherence combinations. At the same time, short-T2 signal quantity is optimized, offering a positive contrast over this component. Imaging experiments over a Lego brick soaked in doped water show an excellent agreement with theoretical predictions. Standard imaging methods in dental radiology are almost exclusively based on X-rays. Not only does magnetic resonance imaging (MRI) avoid ionizing radiation, but has also been shown to be superior in identifying carious lesions. 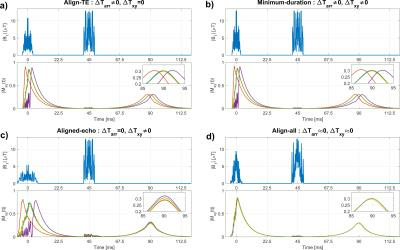 In this work we present a 2D-UTE sequence with an echo time of 35µs, utilizing 240µs half-pulses to ensure reduced signal attenuation from tissues with short T2 relaxation during excitation. The feasibility of the method was demonstrated with the successful acquisition of in vivo MR pantomograms. Gradient imperfections such as gradient delay can cause image distortion and artifacts in UTE imaging. In this work, we report an iterative gradient delay correction method for 3D UTE imaging that allows use of arbitrary gradient waveform model, independent calibration of x, y, and z gradients, and subject-specific delay correction with an embedded prescan. The feasibility of improved image quality using this proposed method was demonstrated by volunteer data. Imaging of the very-short T2 tissues in the head is challenging in that the signals decay very rapidly (T2 < 1 ms), as well as their signal quantity being often overwhelmed by long-T2 relaxing components (fat, free-water). In this work, we explore the feasibility of short-T2 quantification in the white matter and in the cortical bone using a novel method for long-T2 suppression based on diffusion and coherence effects in a steady-state 3D-UTE sequence. A novel method for long-T2 suppression in 3D-UTE imaging is introduced. The method is based on long- and short-T2 components phase states in a dual-segment acquisition scheme (digital summation of two k-spaces before reconstruction, respectively acquired with and without adiabatic inversion), and offers a substantial contrast-to-noise ratio over the different components. We compare our method to the state-of-the-art IR-UTE. It shows higher performance and efficiency in terms of signal suppression and short-T2 contrast. This study aims at showing the feasibility of MR-embedded respiratory motion tracking in ZTE lung imaging. It was shown that the motion information in a moving phantom as well as in free-breathing human volunteers and patients could be extracted from the off-center k-space data sampled during a ZTE acquisition with a faithful accuracy and precision in time and in amplitude with respect to a respiratory belt measurement. This new intrinsic motion follow-up method could be useful for retrospective motion correction of simultaneously acquired PET/MR images. 109 Influence of k-space trajectory corrections on the proton density mapping precision with Ultrashort Echo Time Imaging. 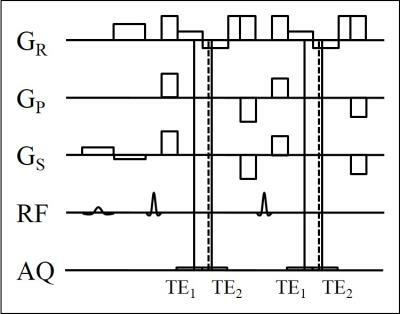 The ultrashort echo time (UTE) sequence is capable to provide information about tissues with short T2. On the other hand, as with all non-Cartesian data sampling schemes in general, it is sensitive to mismatching in the acquisition trajectory. This can be a potential source of errors, especially when used for quantitative applications such as proton density (PD) mapping. This problem can be reduced by calibration and correction of the k-space acquisition trajectories. 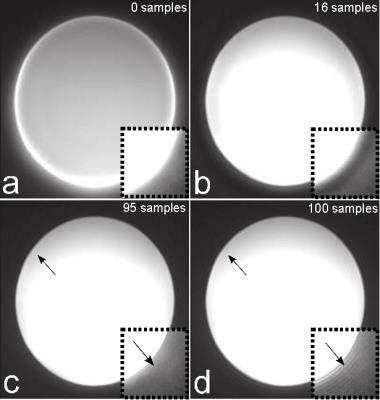 The presented experiments demonstrate the importance of sampling trajectory corrections for UTE imaging, especially when applied for quantitative measurements. The current work aims to provide a volumetric, fast and silent method for quantitative T1 mapping with Zero Echo Time (ZTE) imaging, and generate multiple T1-weighted images at virtual inversion times. By designing an interleaved radial trajectory for ZTE, and constraining the temporal behavior of the signal with low-dimensional subspace and spatiotemporal low rank regularization, we conducted a volumetric T1 mapping in 2 minutes with acoustic noise only 1.1dB higher than scanner background. One version of a new ultrafast gradient-echo-based 3D imaging technique using spatiotemporal encoding (RASE-I) is proposed which can provide very short TEs in some slices. RASE-I maintains most of appealing features of other spin-echo-based SPEN imaging methods including no Nyquist ghosting and high tolerance to field inhomogeneities. It is barely affected by T2* signal modulation and less sensitive to T2* effects due to local rephasing mechanism along the SPEN direction. 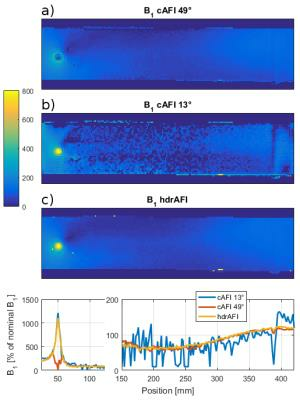 Its performance is demonstrated by lemon and in-vivo mouse kidney imaging at 9.4T, including the measurement of dose-dependent arterial-input-function (AIF) of kidney-feeding artery. High resolution MRI of fast relaxing spins in human sets strong requirements on hardware and pulse sequences. Indeed, the acquisition duration is limited by the relaxation time of the protons of interest and high resolution can only be achieved with large magnetic field gradients. Also when large field-of-view is required, additional challenges appear. The sequence and receive hardware needs to be adapted to larger bandwidth. In this work, we image short T2 compounds in human scanners with gradient strengths up to 200 mT/m and bandwidth up to 1.63 MHz. Sixteen SS patients and age- and gender- match healthy volunteers underwent parotid MR imaging to evaluate whether T1ρ values could diagnose of SS patients. T1ρ values between the patients and healthy volunteers were compared. ROC analysis was used to evaluate the diagnostic performance of the T1ρ values. The T1ρ values of SS patients were significantly higher than those of healthy volunteers. With a cutoff value of 88.02 ms, the diagnostic sensitivity and specificity of the parotid T1ρ value was 75.0% and 100.0%, respectively. Parotid T1ρ MR imaging held the potential in the diagnosis of SS without morphological changes of glands. MRCDI aims at imaging an externally injected current flow in the human body, and might be useful for many biomedical applications. However, the method requires very sensitive measurement of the current-induced magnetic field component ?Bz,c parallel to main field. We systematically optimized MESE to determine its most efficient parameters. 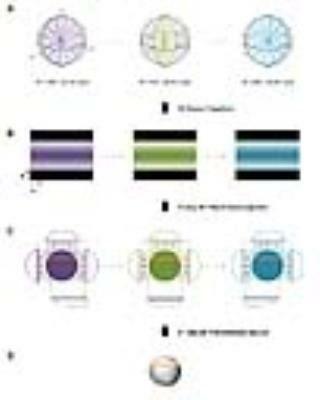 In one of the first human in-vivo applications of MRCDI, the optimized sequence was successfully used to image the ?Bz,c distribution in the brain caused by a two-electrode montage, as confirmed by finite-element calculations of ?Bz,c. Further improvements will be performed to increase its robustness to field drifts. 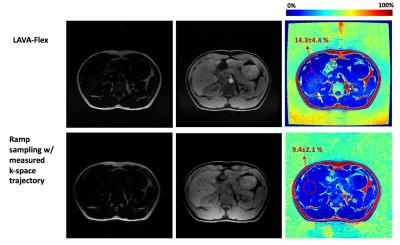 Generating MRI-based pseudo-CT images, providing electron density information for dose calculation, is the first step towards MRI-based radiation therapy treatment planning. Existing methods either require prior knowledge of a CT-MR atlas or require acquisition of multiple scans. In this study, we demonstrated the feasibility of producing pseudo-CT images by using a single multi-gradient-echo sequence. This method takes advantage of tissue-specific relaxation properties of MRI signal to provided segmentation of bone, air and other anatomical structures. Since all images are generated from a single scan and are naturally co-registered, this method is fast and avoids registration errors. 116 Multi-compartment T2 relaxometry Model using Gamma Distribution representations: A framework for Quantitative Estimation of Brain Tissue Microstructures. Advanced MRI techniques (e.g. – d-MRI, MT, relaxometry etc.) can provide quantitative information of brain tissues. Image voxels are often heterogeneous in terms of microstructure information due to physical limitations and imaging resolution. Quantitative assessment of the brain tissue microstructure can provide valuable insights into neurodegenerative diseases (e.g. - Multiple Sclerosis). In this work, we propose a multi-compartment model for T2-Relaxometry to obtain brain microstructure information in a quantitative framework. The proposed method allows simultaneous estimation of the model parameters. T1 and T2 measurements in polarizing field systems have long acquisition times due to the inclusion of a polarizer pulse. Current work demonstrates Fast, RObust and SimulTaneous relaxometry (‘FRoST’) measurements at Earth’s field on water and CuSO4 phantoms. 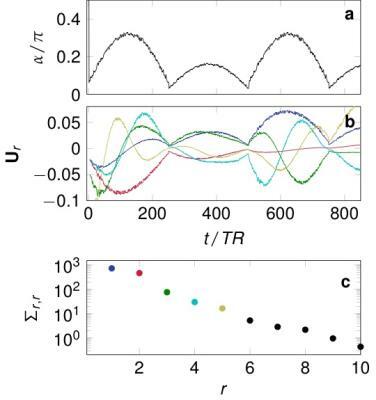 FRoST creates a variation of the net magnetization through a series of CPMG acquisitions by varying the polarizing pulse (τp) to obtain simultaneous T1 and T2 weighting. 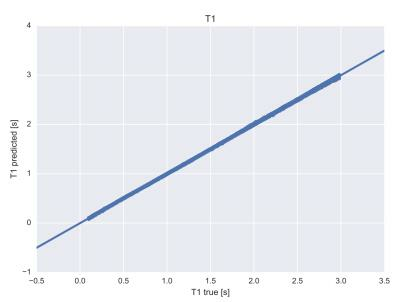 T1 and T2 values obtained are similar to standard sequences and the acquisition time is reduced by 55%-84%. In this work we estimated the impact of myelin’s magnetic susceptibility anisotropy on the Myelin Water Fraction (MWF) at 3T and 7T. We simulated realistic multicomponent T2* decay and then computed the MWF using three different fitting models. 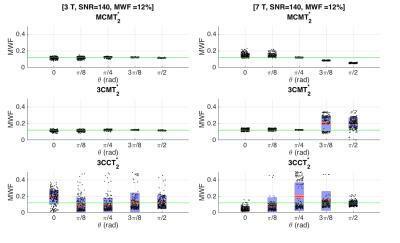 Our findings indicate that the effect of myelin’s magnetic susceptibility anisotropy does not need to be considered when computing the MWF at 3T. However, failure to do so at 7T can lead to a significant bias in the MWF. To increase the contrast between the bone and the cartilage, fat saturation techniques are additionally applied to the conventional imaging sequences. However, the fat saturation techniques eliminate most of the bone information. Thus, using the modified bSSFP (balanced steady-state free precession) pulse sequence called a hybrid bSSFP pulse sequence, the proposed method offers the multi-contrast knee images with very short imaging time (< 10 sec). 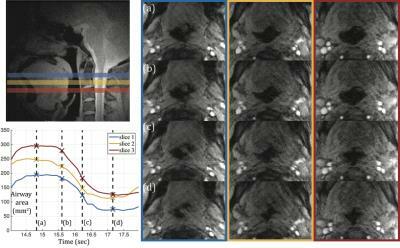 The potential of high resolution steady state diffusion and magnetization transfer (MT) imaging approaches with short acquisition times of less than 2min were investigated for the depiction of the spinal cord. As a surprising result, diffusion weighted time-reversed fast imaging with steady state precession (PSIF) sequences are not able to generate notable diffusion based contrast in the spinal cord (identical diffusion quotient DQ = 1.96+-0.20). 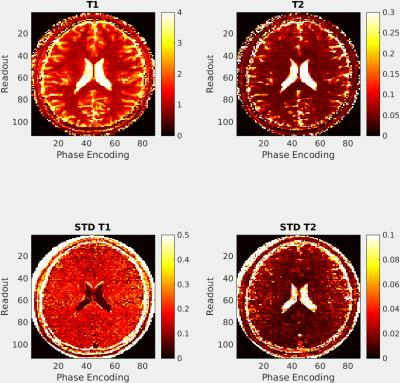 High resolution balanced steady state free precession (bSSFP) sequences, however, are able to depict MT induced signal saturation in spinal cord white matter (MT ratio = 0.30+-0.07).